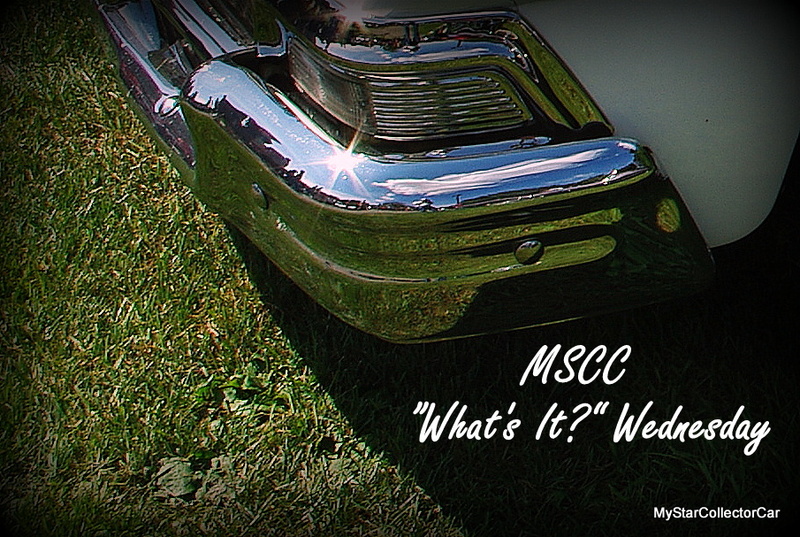 MSCC What’s It? 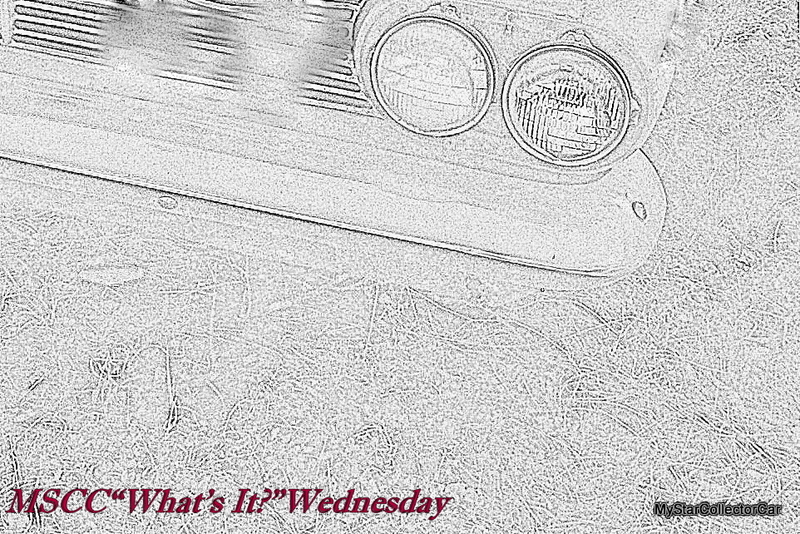 Wednesday is back for 2017. 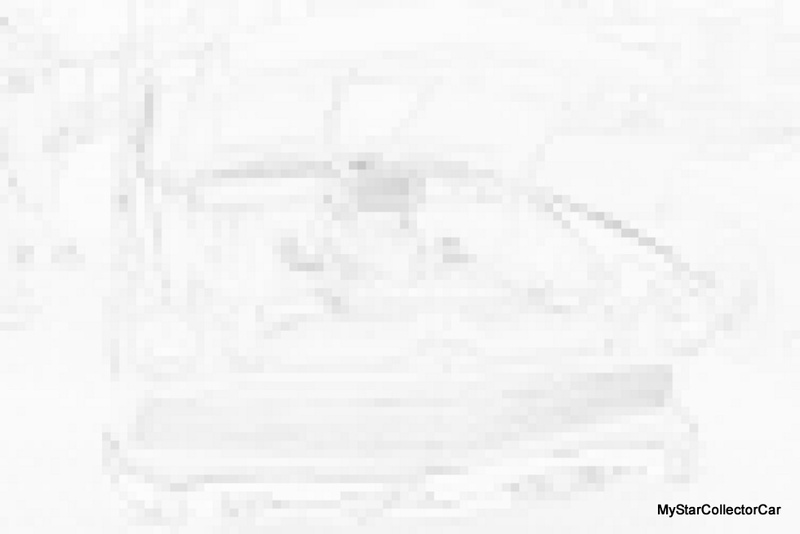 This is a weekly guessing game for car guys and it was one of the most popular new MSCC features in 2016. 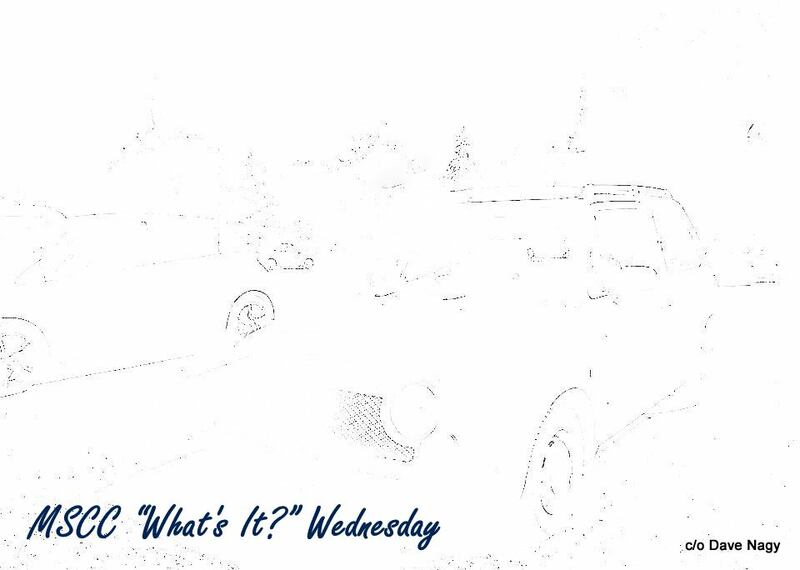 2017 was a typical year for MSCC “What’s It?” Wednesday—some were easy, some were a little tougher and a few were never solved. Feedback was fierce about the unsolved ones. 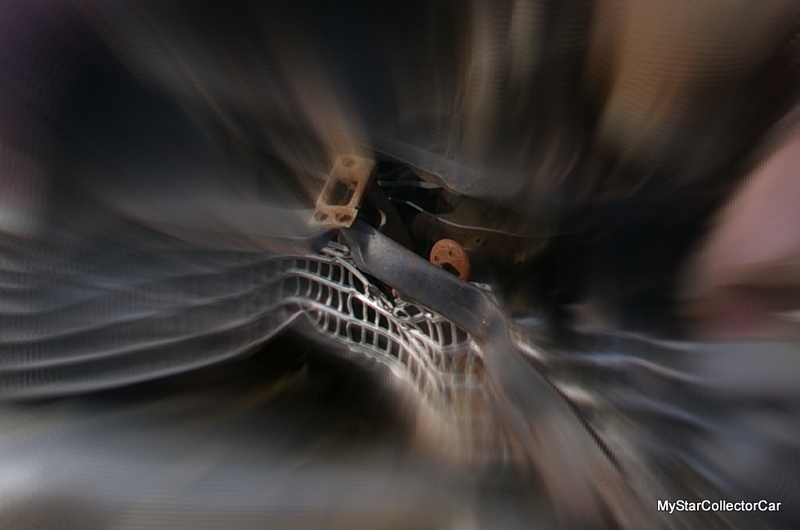 Here’s the second clue—you decide if it’s easy, moderate or impossible. 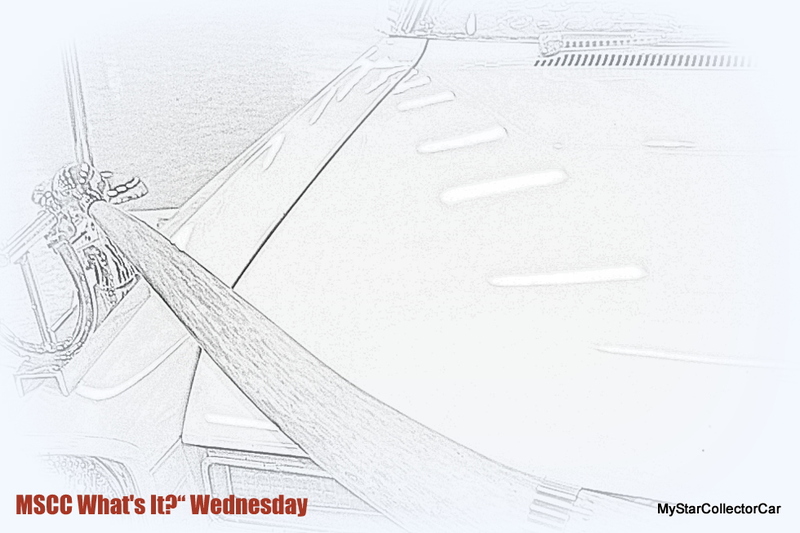 If it’s impossible you can end the year with the correct answer here on Thursday. The format for What’s It? 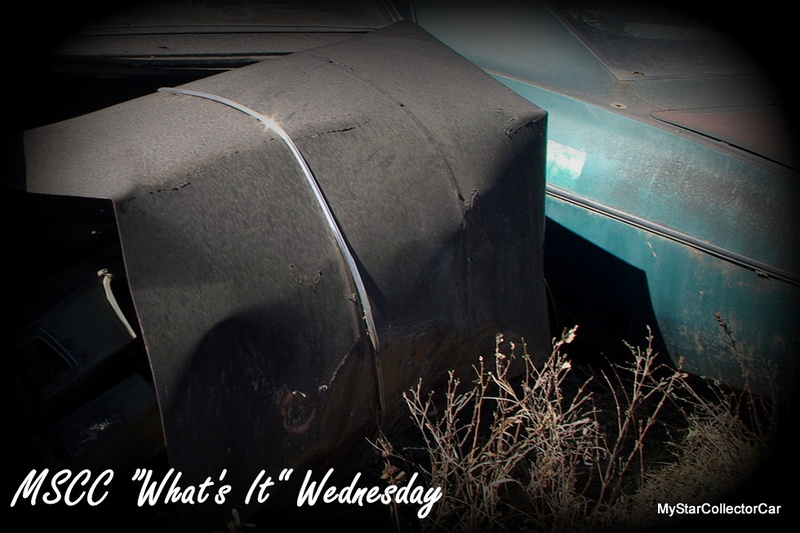 Wednesday has always been two clues so it was time for a change in pace—this time you get three clues. If the 1st two weren’t enough here’s the third clue. 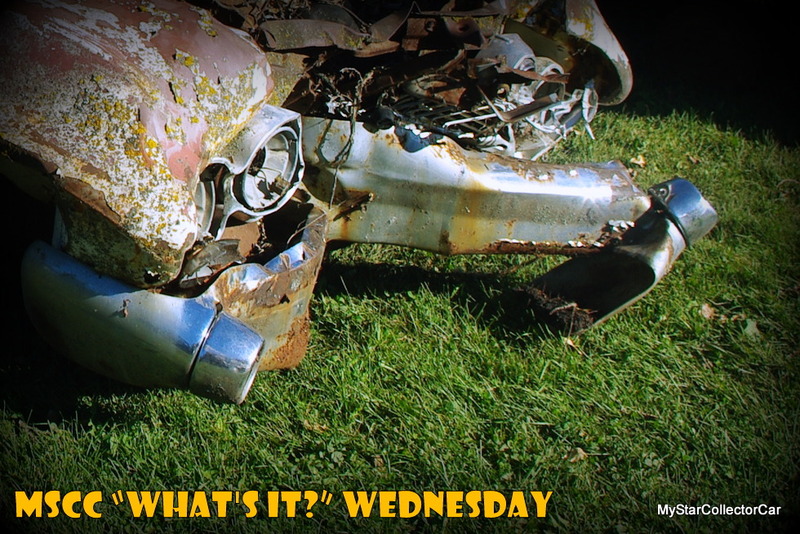 If that doesn’t work check back Thursday and you’ll get the answer with a 4th clue. 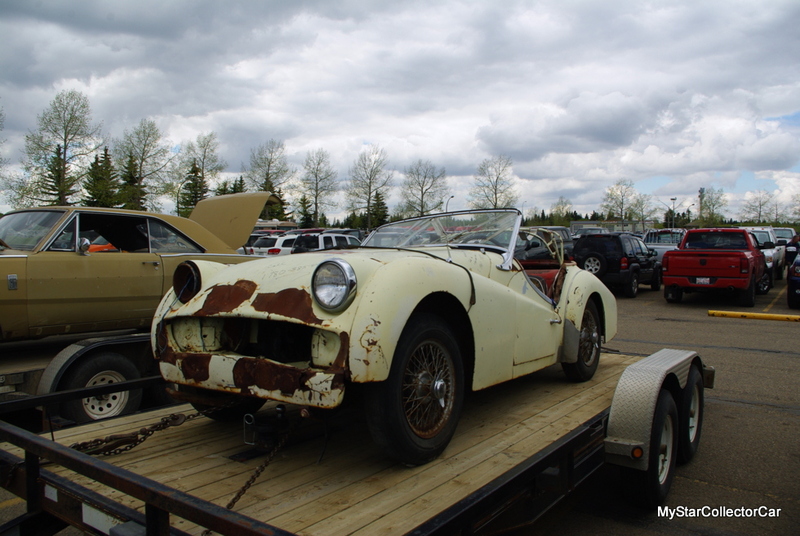 It’s a ’61 Triumph TR3. 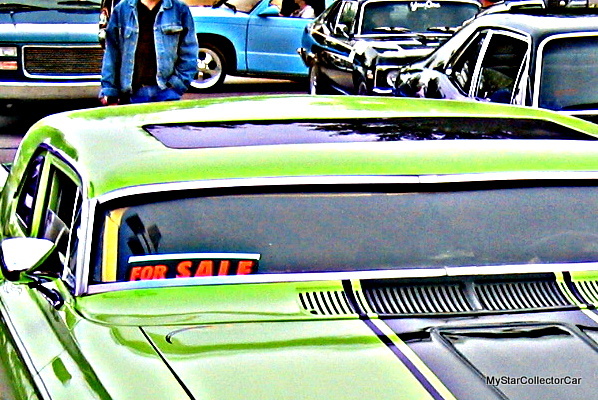 Some cars are a dead giveaway when you only see the headlights. 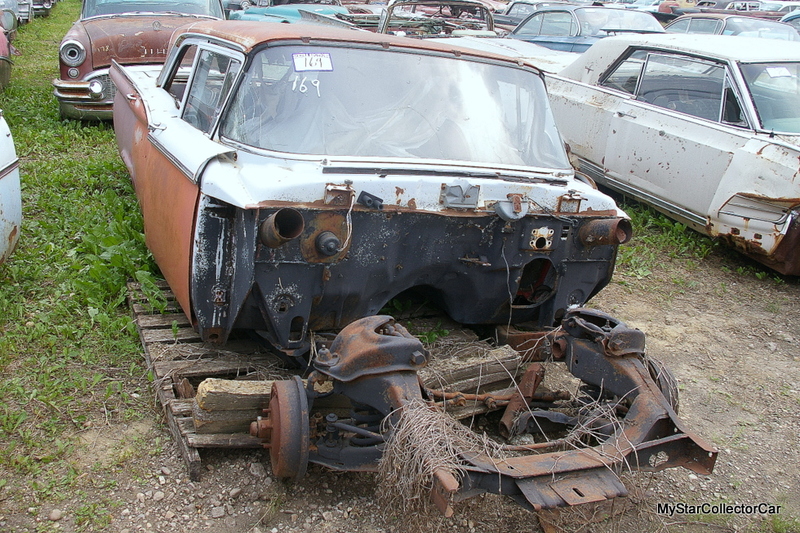 The ’53-54 Vettes are good examples as are the 1961 Plymouths but most cars run with generic headlights so maybe this hood will seal the deal. 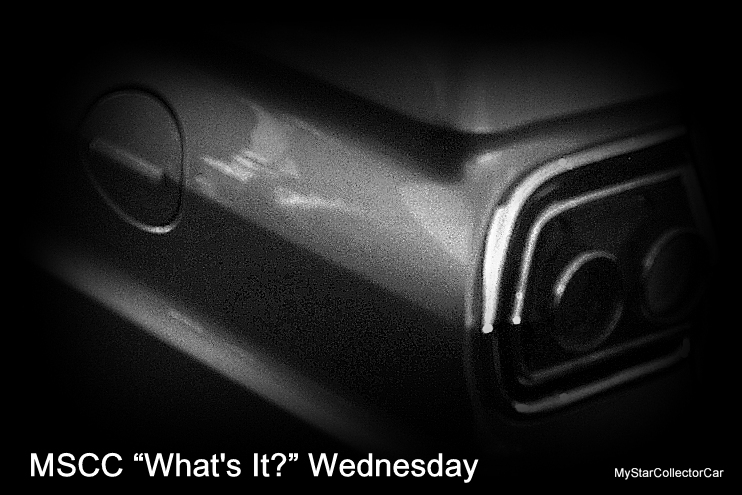 If not, check back on Thursday and you’ll see what’s behind the headlight. 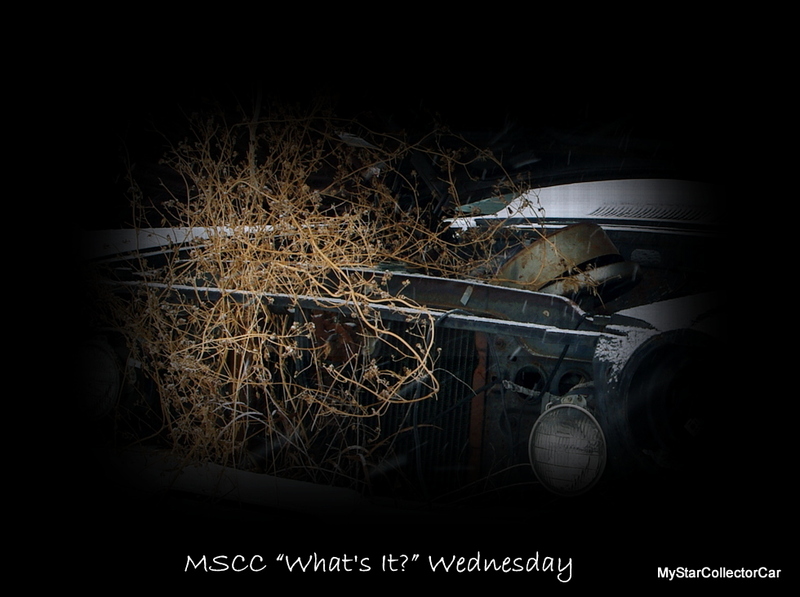 Most MSCC “What’s It?” Wednesday rides are hidden behind some kind of digital curtain to make you work harder but this one came with a natural curtain. 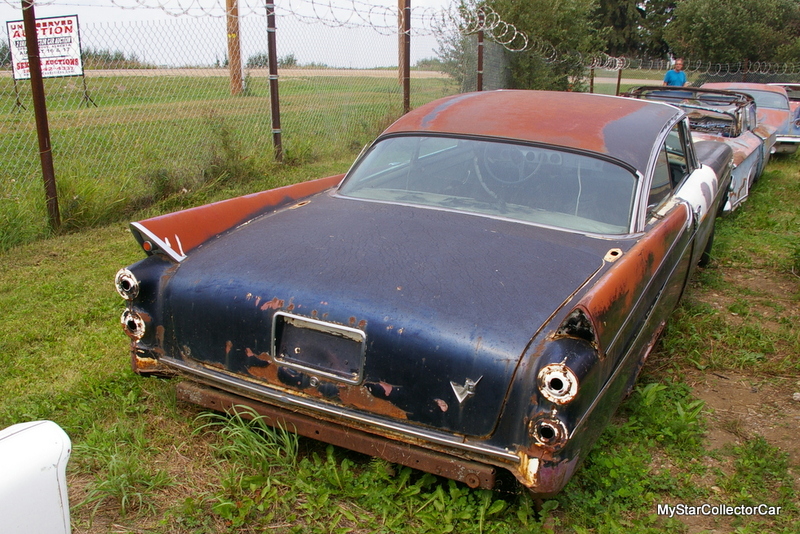 Here’s a peek at the back half of the car. If this doesn’t help, check back on Thursday when the curtain gets lifted. 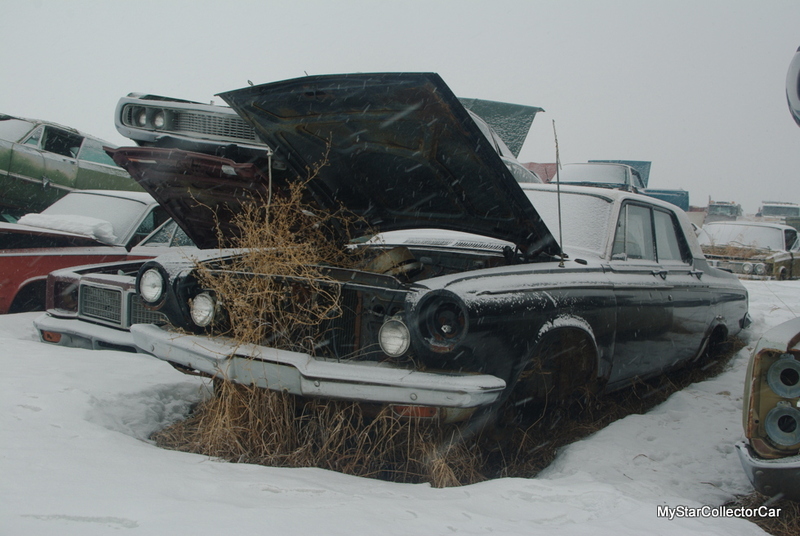 It’s a ’64 Ford Galaxie. 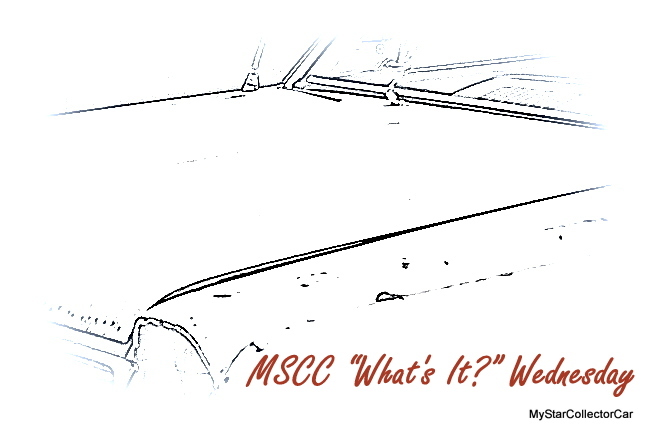 Full disclosure—most guys guess wrong on MSCC What’s It? 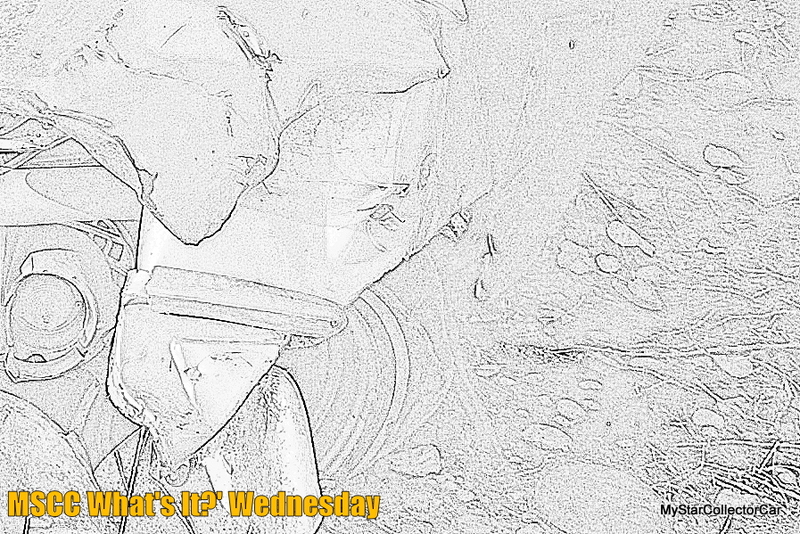 Wednesday but they often make great guesses. That’s because these clues are based on a sleight of hand—it’s kind of like playing poker with a card cheat. 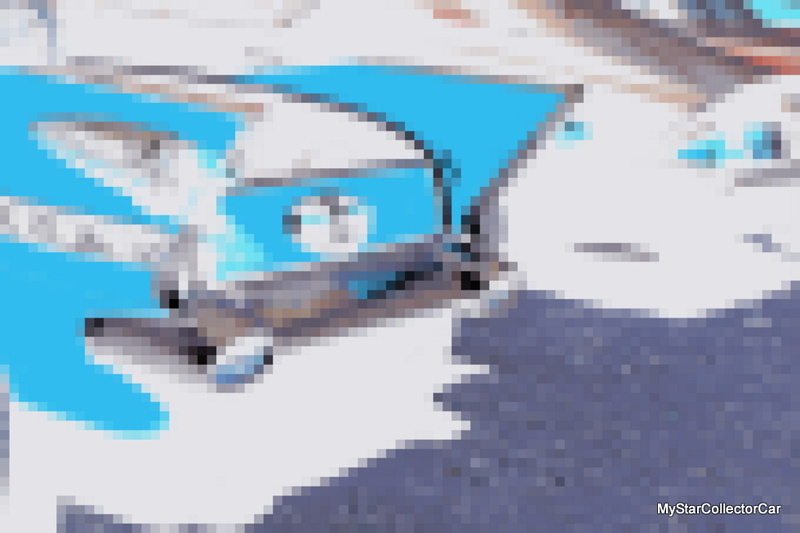 Here’s the second clue so you get another card. If that card doesn’t help then you’ll see all the cards here tomorrow. 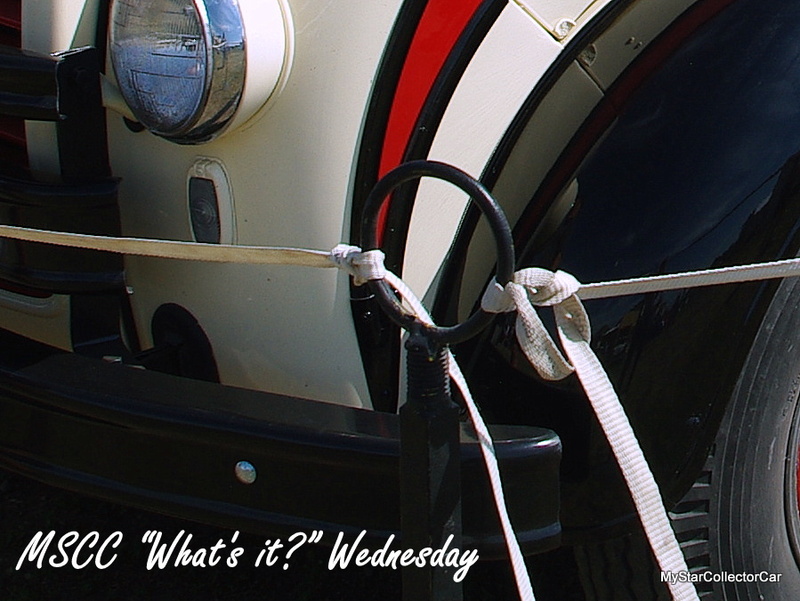 Last week was a record for MSCC “What’s It?” Wednesday because a lot of people solved it so this wee will be more of a challenge. 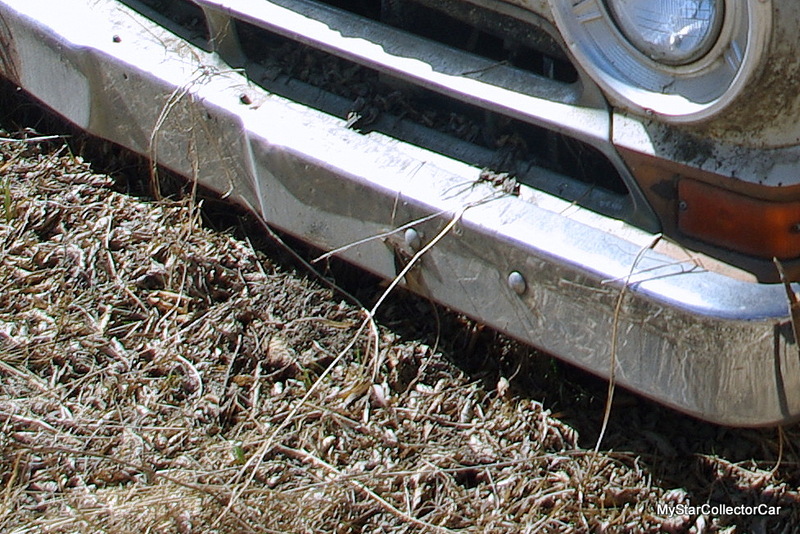 Here’s the 2nd clue—you might need it. 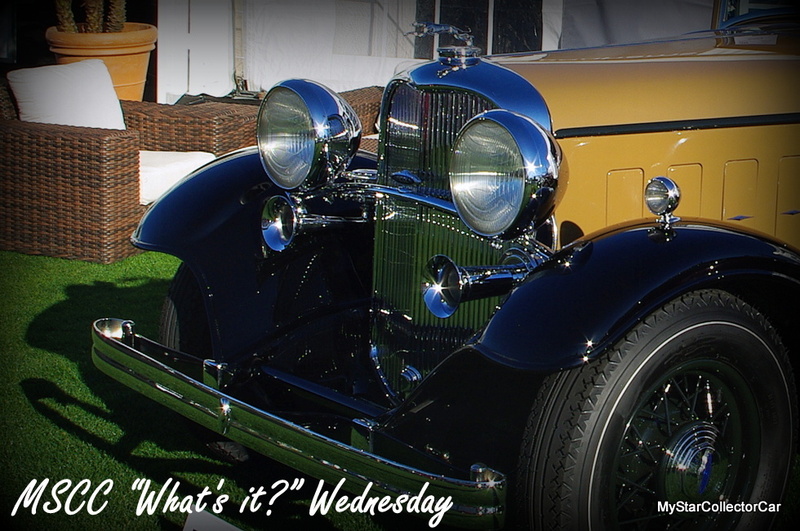 Find the answer here on Thursday—you may need the cheat sheet for this one. 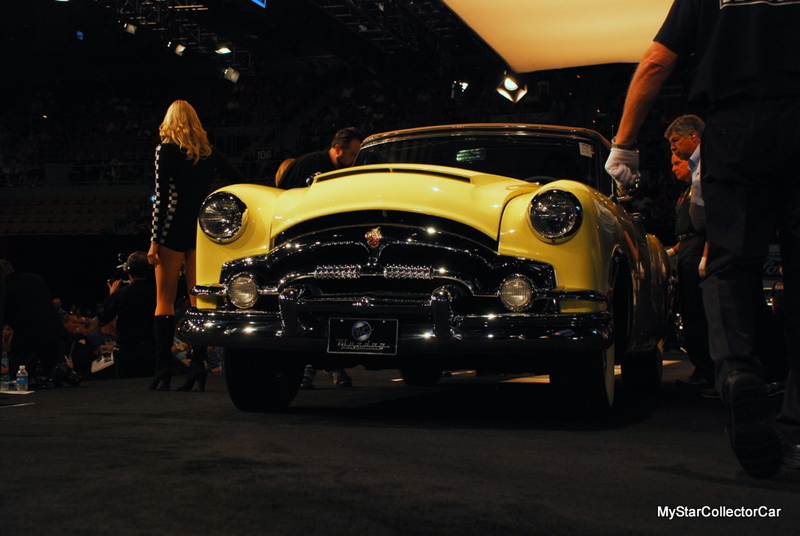 It’s a ’53 Packard convertible. 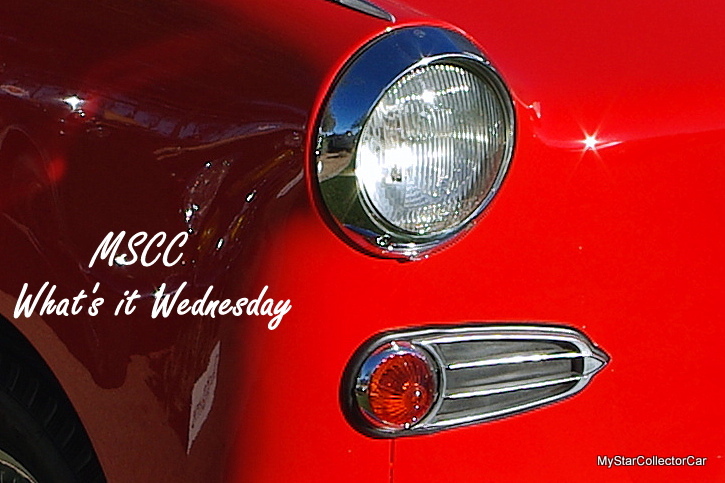 This week’s MSCC clues are pretty basic—a headlight and a taillight. 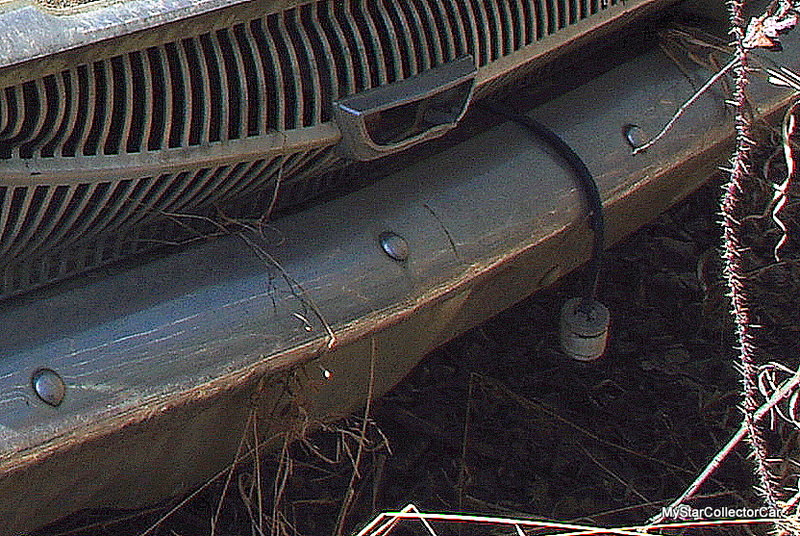 Here’s the taillight for the 2nd clue. Did that help? 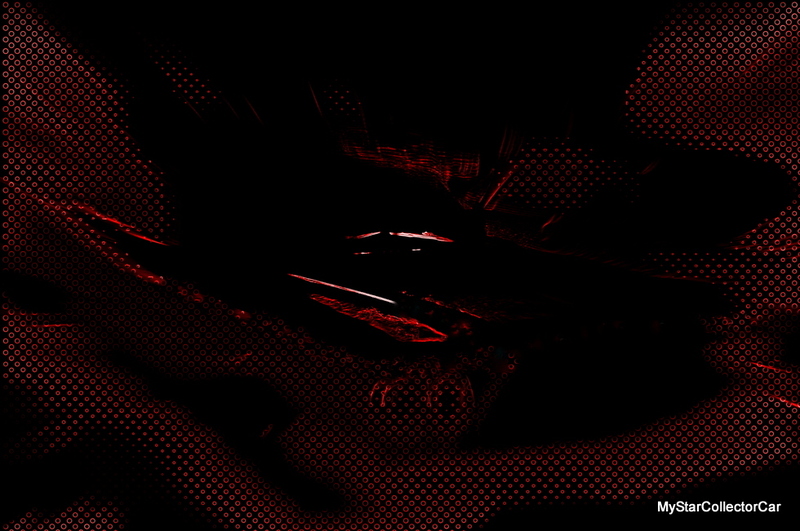 Look for the answer on Thursday. 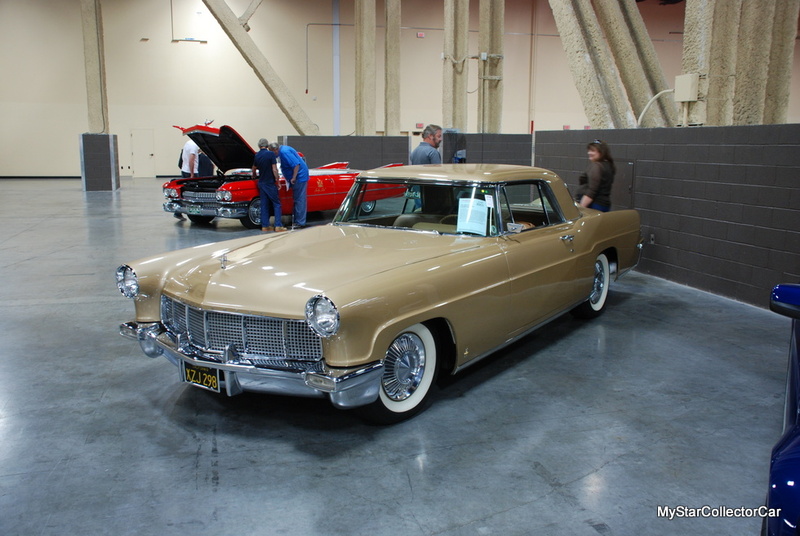 It’s a ’57 Lincoln MK II. Last week was one of those giveaway What’s It? clues because many readers nailed it on the 1st clue. Hopefully this one is so tough you’ll need this 2nd clue. 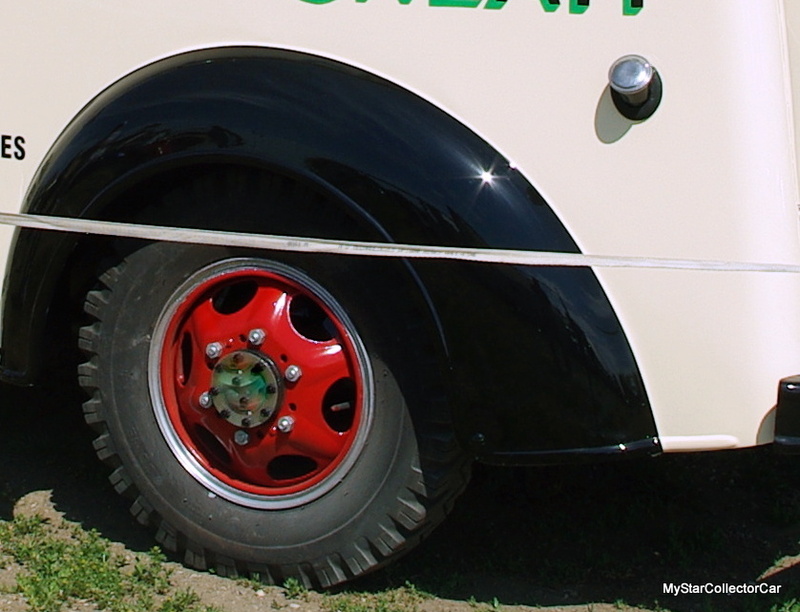 Hopefully this one isn’t so tough you’ll need the answer here tomorrow. 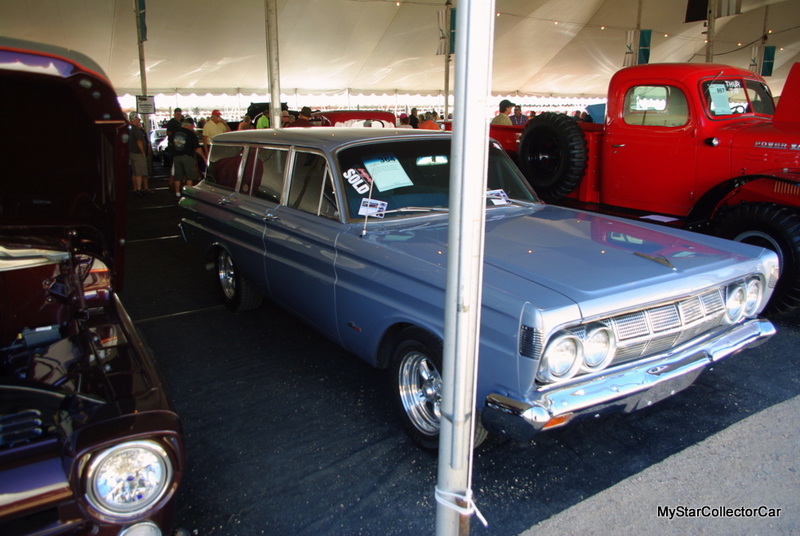 It’s a ’64 Comet wagon. 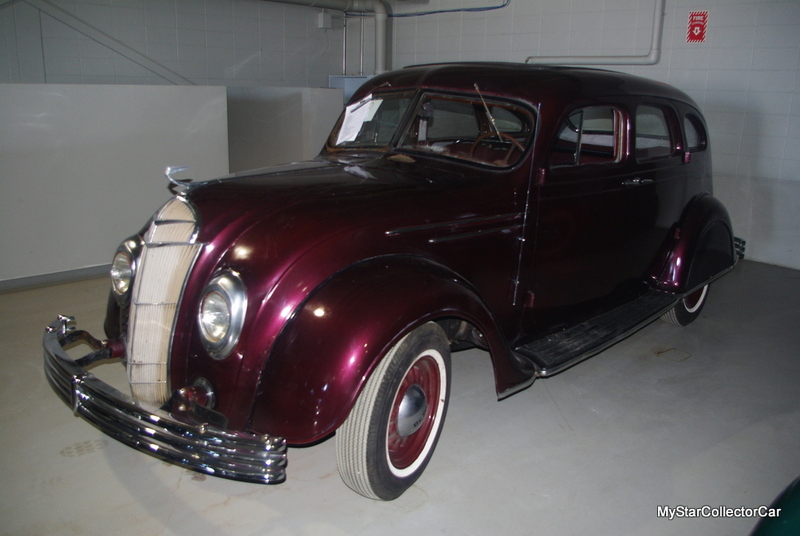 Most of the “What’s It” Wednesday picks are in less than pristine condition but this one is restored and in one piece so that should really help. 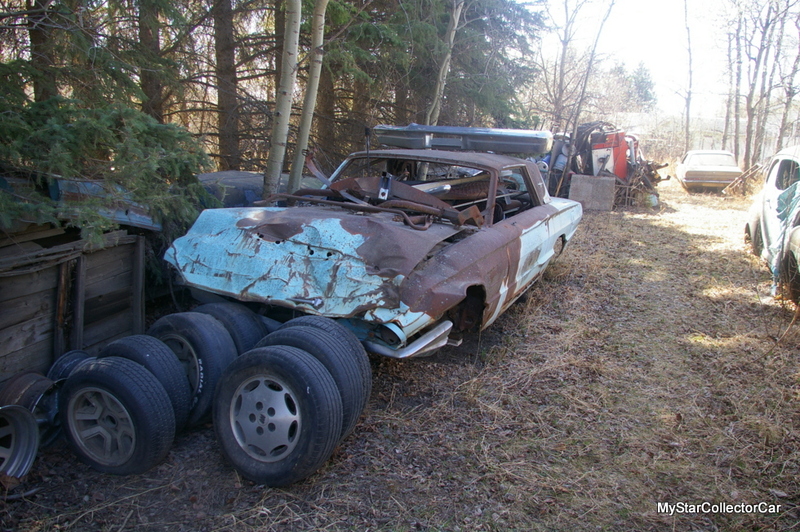 Maybe this rear fender is the final piece in the puzzle. 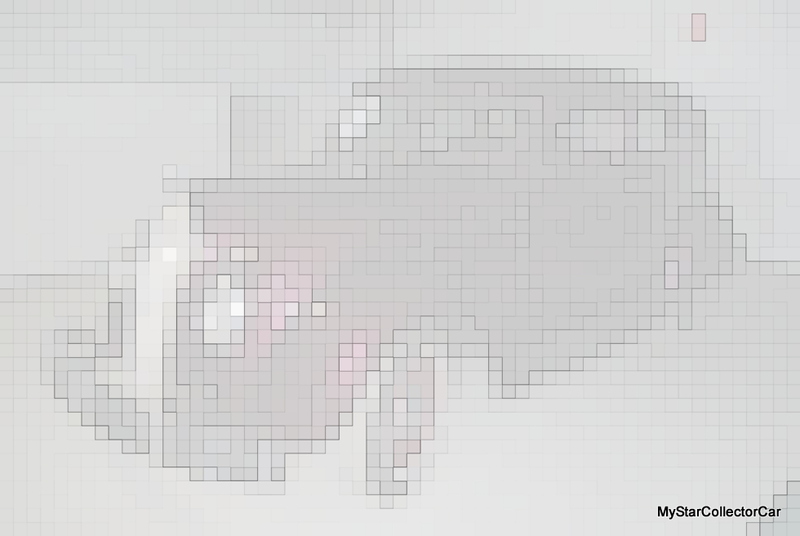 If not, check back tomorrow to solve the puzzle. 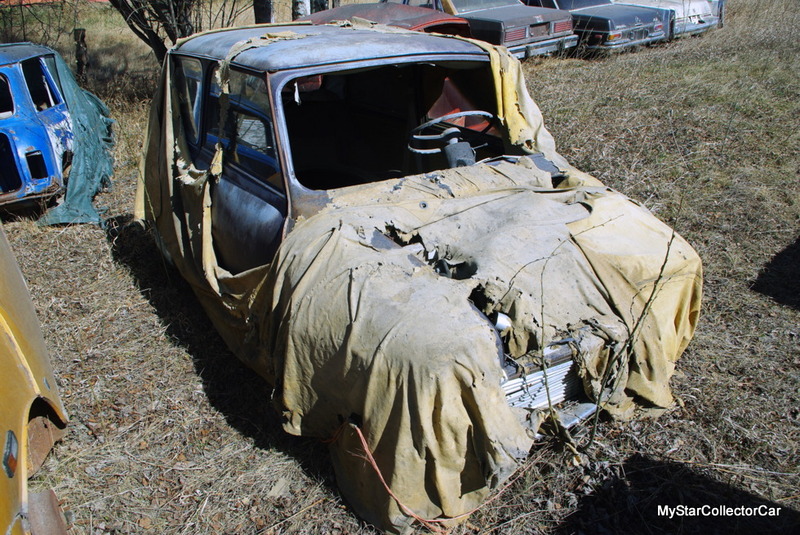 MSCC OCTOBER 25, 2017 “WHAT’S IT?” WEDNESDAY—CAN YOU SEE THROUGH A TARP? 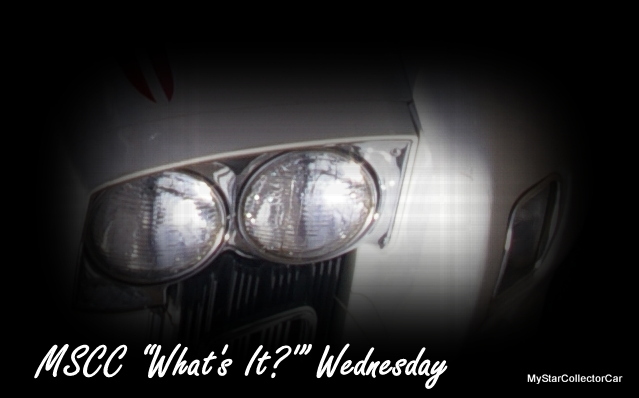 What’s It? 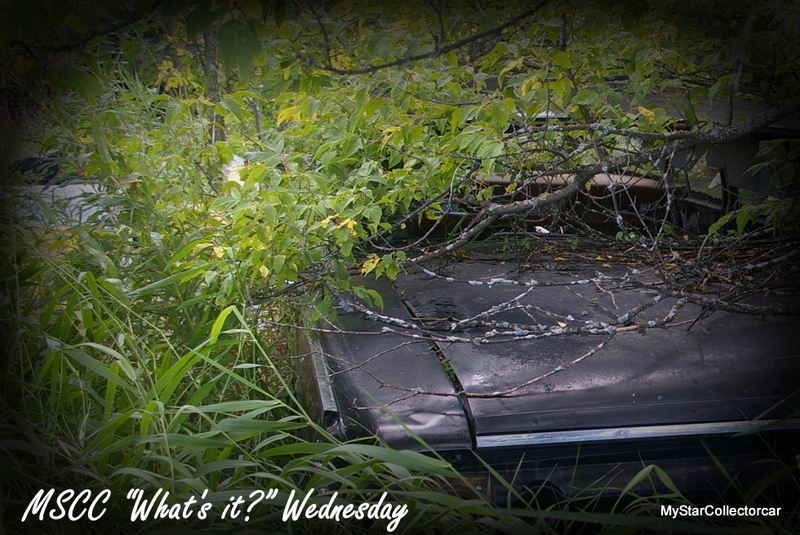 Wednesday employs several different methods to make your guess more difficult—this tarp is one of those methods. 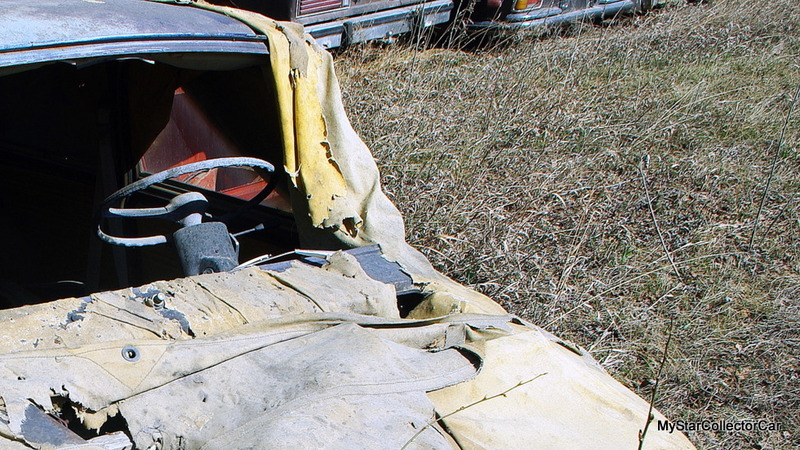 If the tarp picture didn’t help, perhaps this shot of the windshield (or more accurately, where the windshield used to be) will give you a clue. 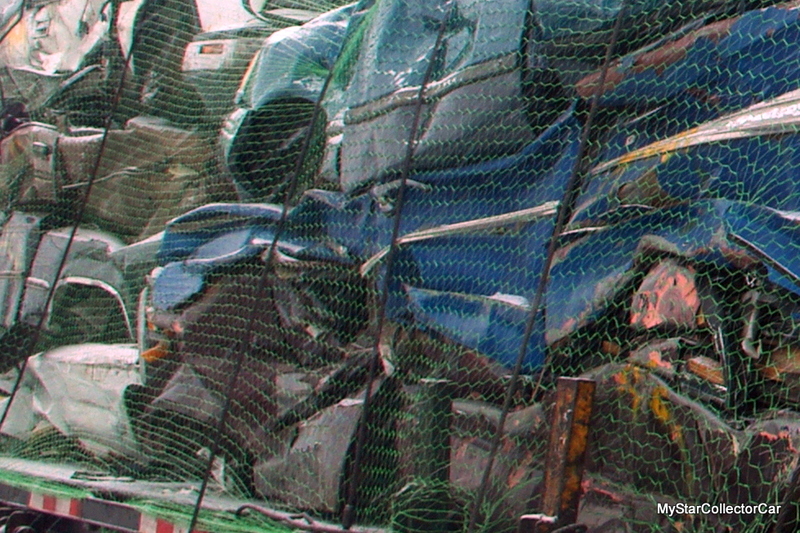 If not, check back tomorrow for a full picture and answer—you’ll find it below. 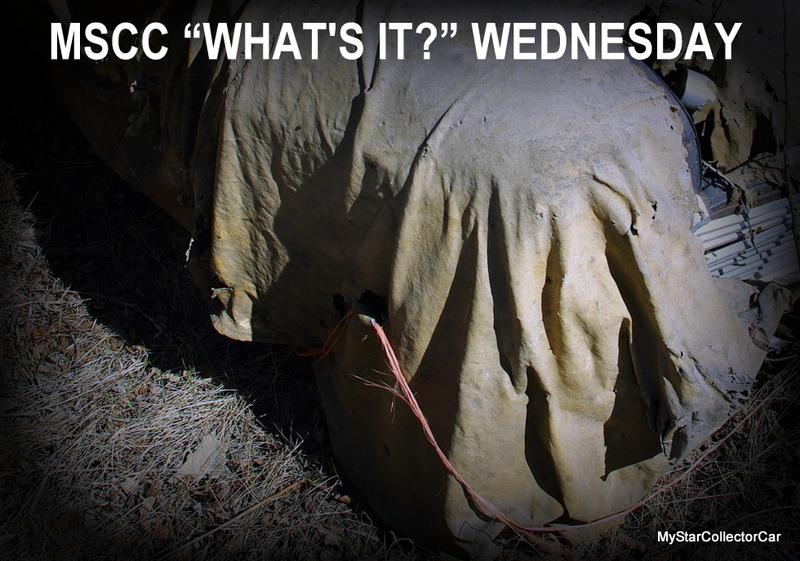 Last week was easy for the MSCC “What’s It?” Wednesday and that’s a good thing because you can’t make people climb Mount Everest-sized clues to solve a puzzle. 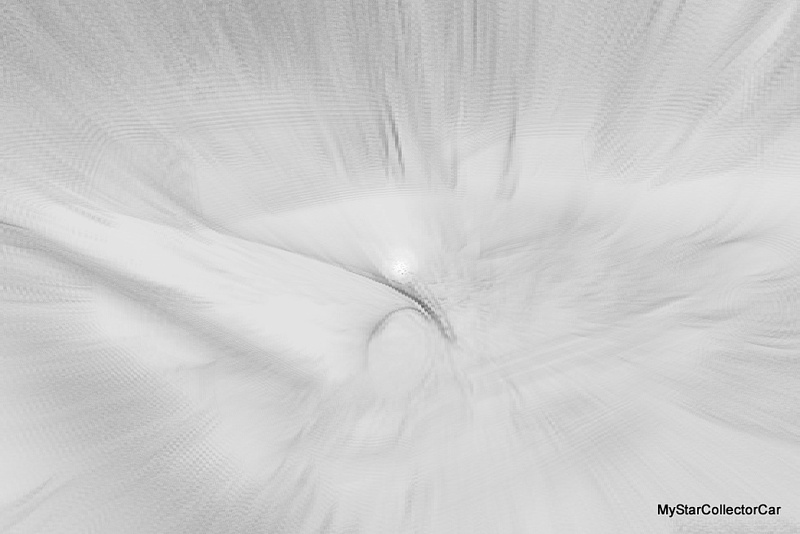 This week isn’t Mount Everest—it’s in the sweet spot for clues so it’s more like a small hill—here’s the 2nd one. 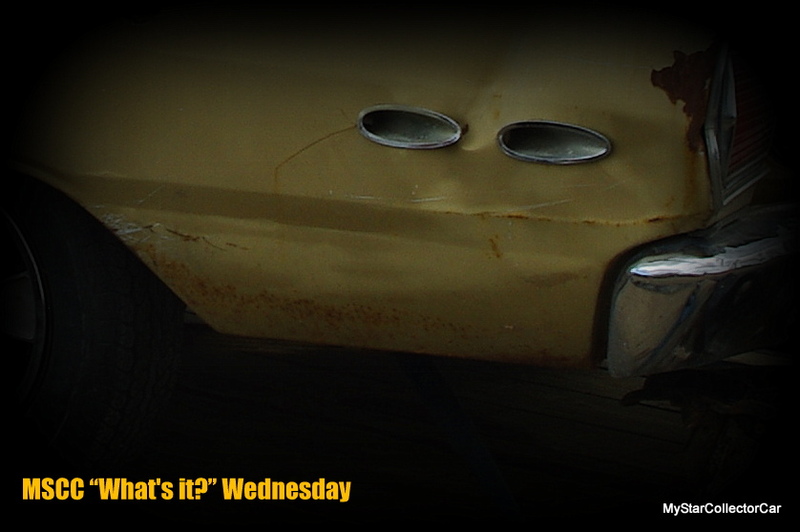 If that isn’t sweet enough then check back for the answer tomorrow. 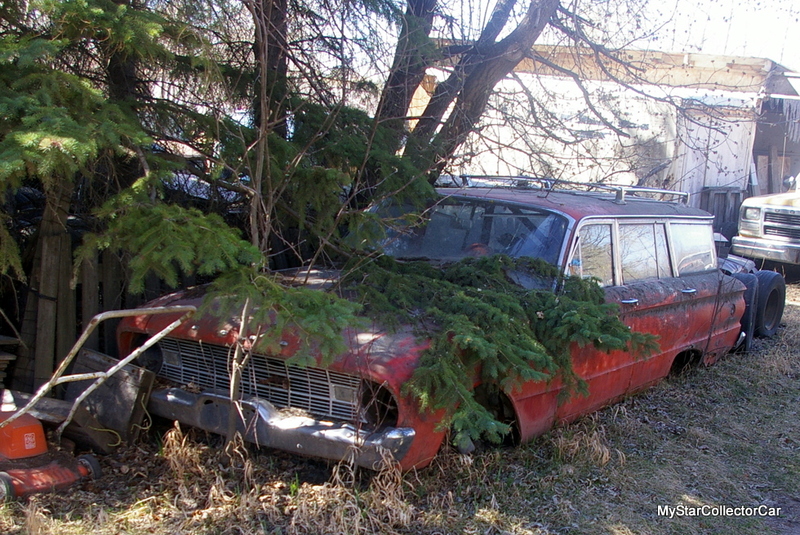 It’s a ’62 Merc wagon. 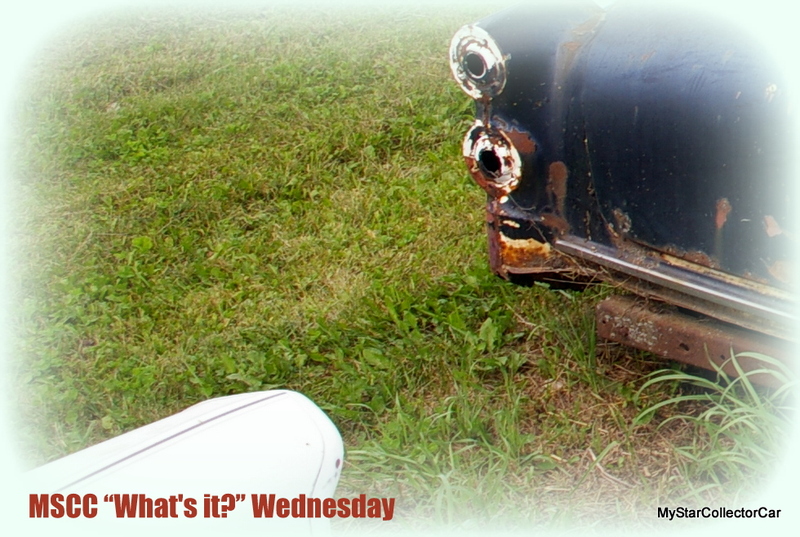 Some MSCC “What’s It?” Wednesday clues are sequential in nature so the second clue helps solve the puzzle. 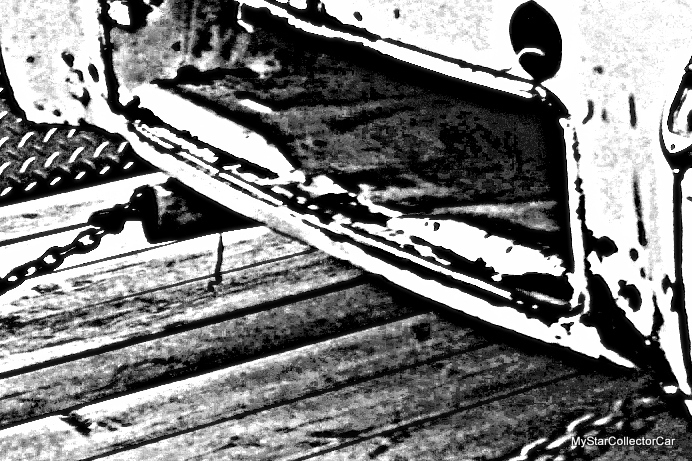 That may or may not be the case in this “What’s It?” because if you really know what it is, the first clue will solve it but here’s the 2nd one. If both clues don’t solve it you can always check back tomorrow and see the answer below. 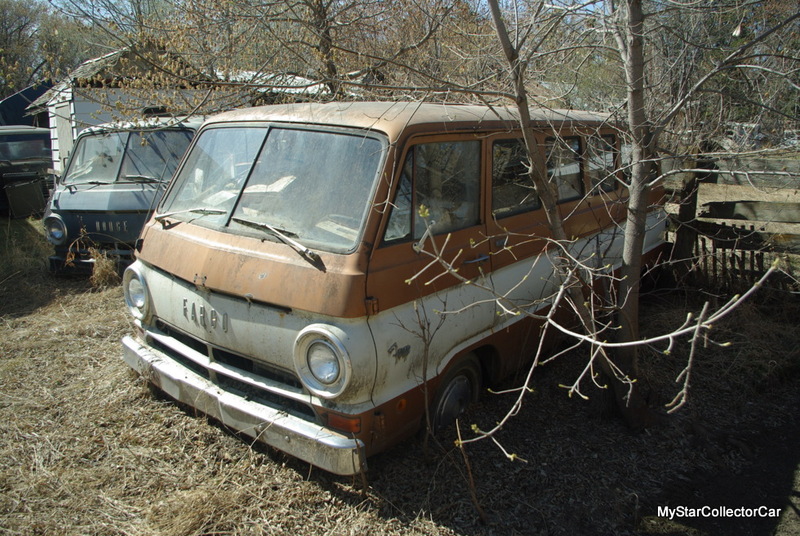 It’s a ’68 Fargo A-100 van. 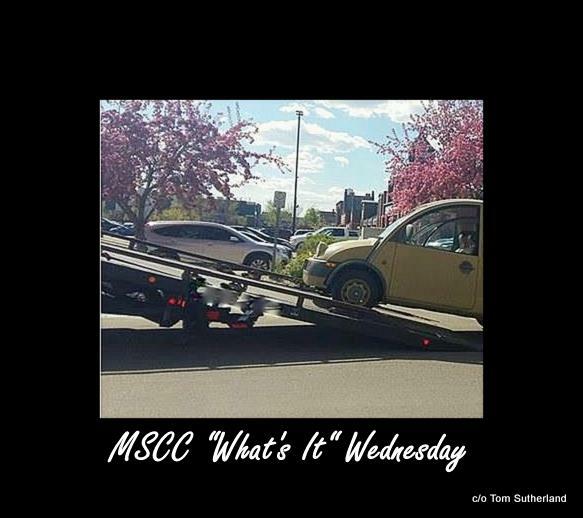 MSCC “What’s It” Wednesday is a lot like the Goldilocks story where the Three Bears’ beds were too soft, too hard and just right—it has to be a solvable puzzle but it can’t be too easy. 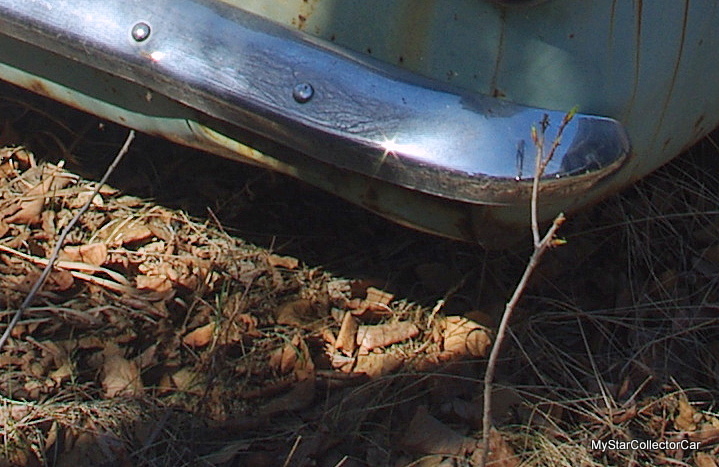 Last week’s was clearly too easy but this one might be too—especially with this 2nd clue. If it’s too hard then maybe you’ll need the answer tomorrow. You’ll find it below. 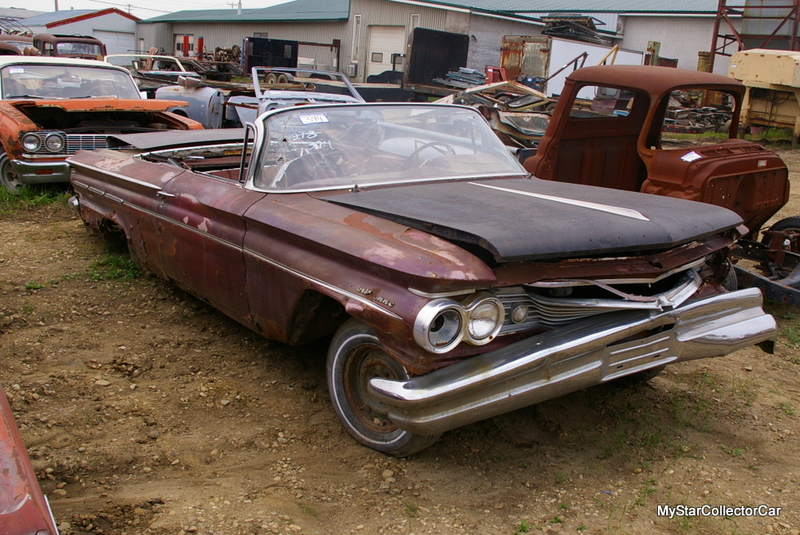 It’s a 1960 Pontiac Parisienne convertible. 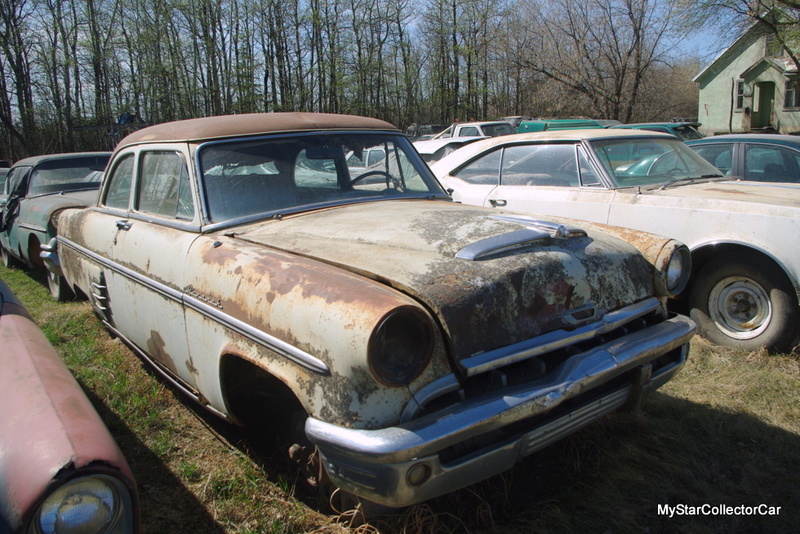 The late 1950s were known for very distinctive, fin laden cars so you never confused a Dodge with a Chevy in the Fabulous 50s. 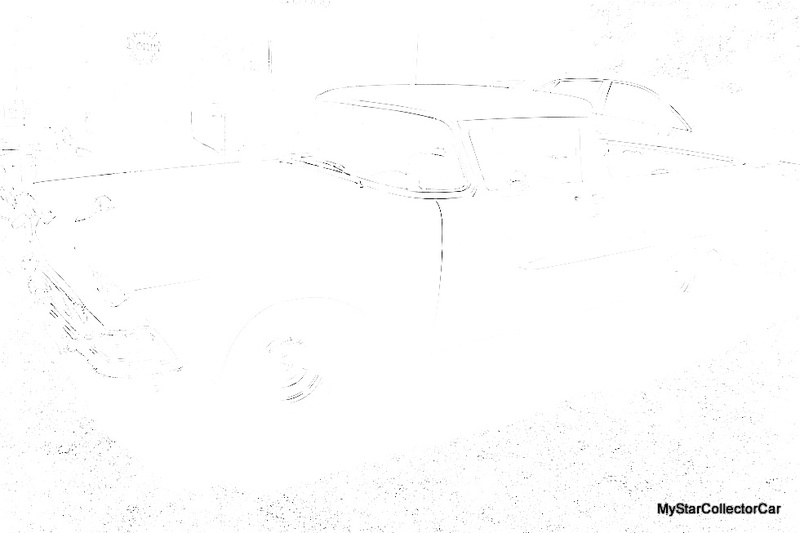 This car is clearly from that era so this 2nd clue should make it a slam dunk. 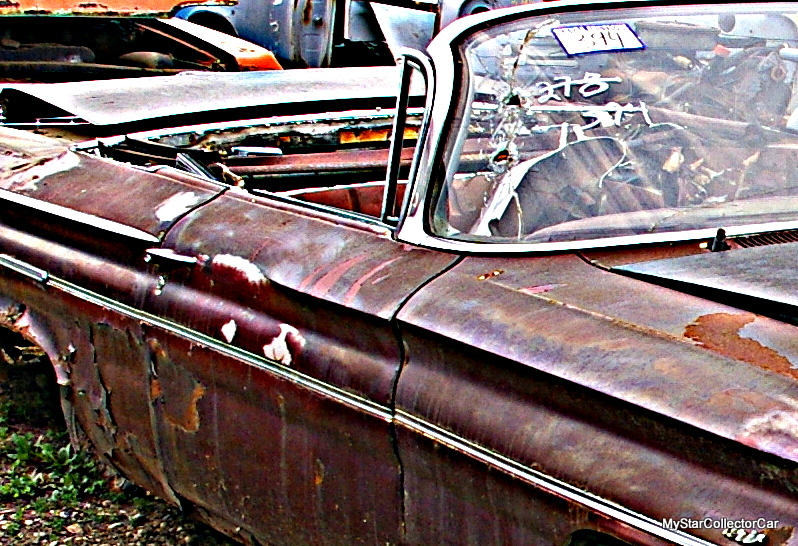 Too tough for you–even with a Google search? 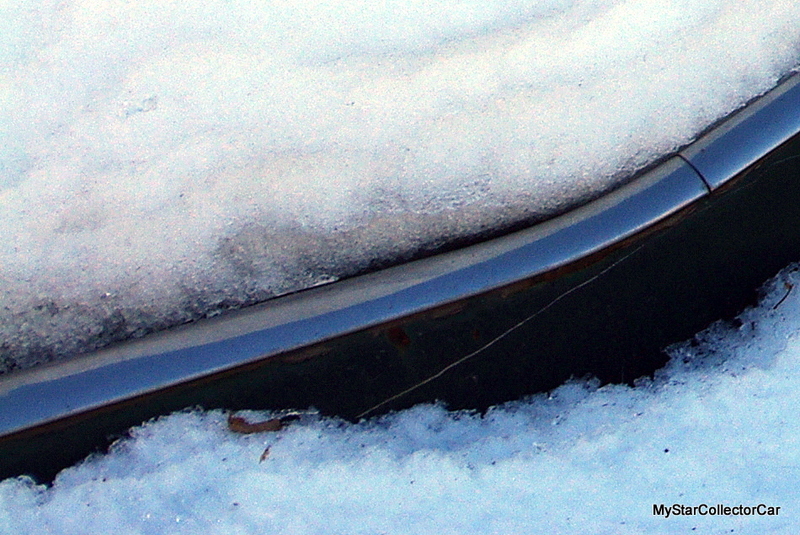 OK-check back tomorrow (you quitter) and you’ll get a spoon fed answer. 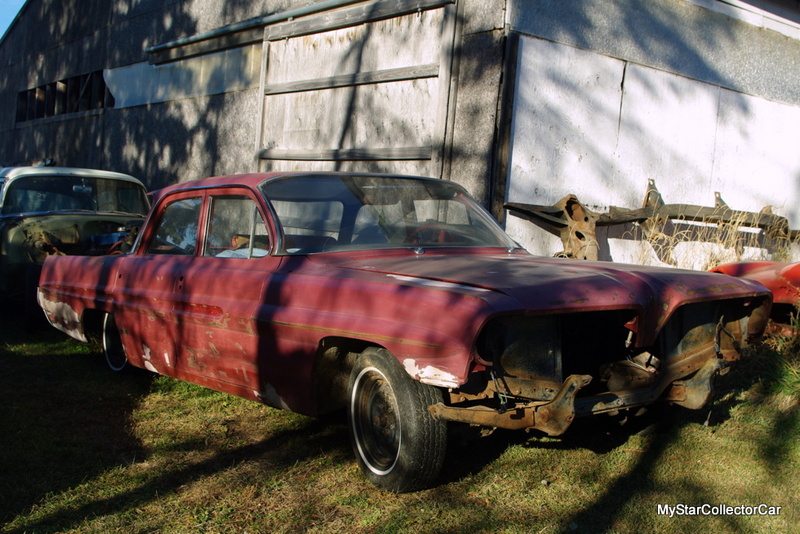 It’s a ’58 Studebaker Commander. 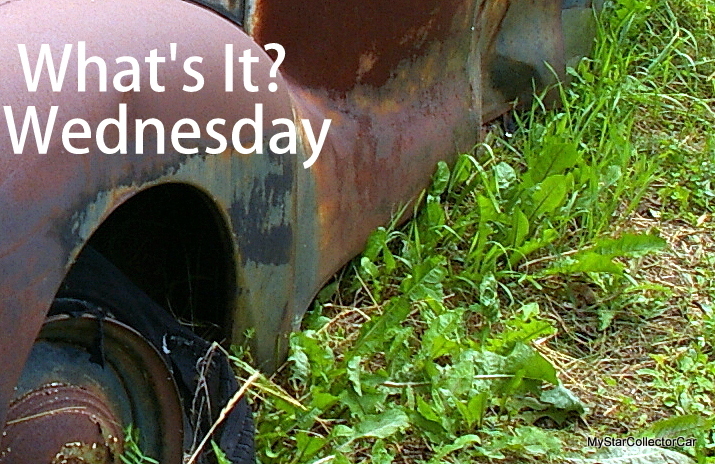 There’s a good reason why “What’s It?” Wednesday has two clues—one clue usually isn’t enough. 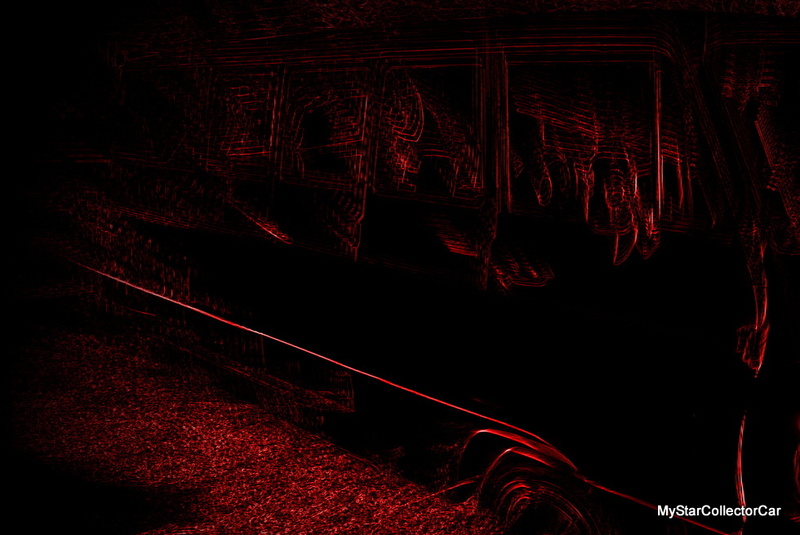 That’s why you may need to look at this second clue. 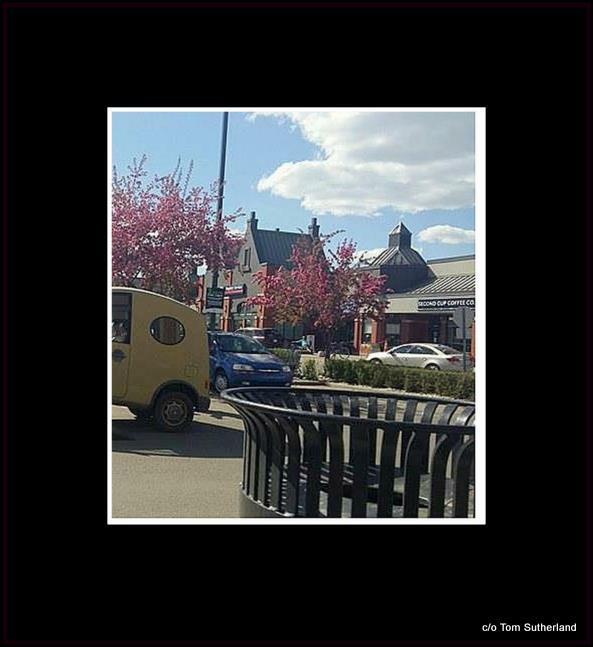 Come back here for the third clue tomorrow if you need it becomes it comes with the answer. 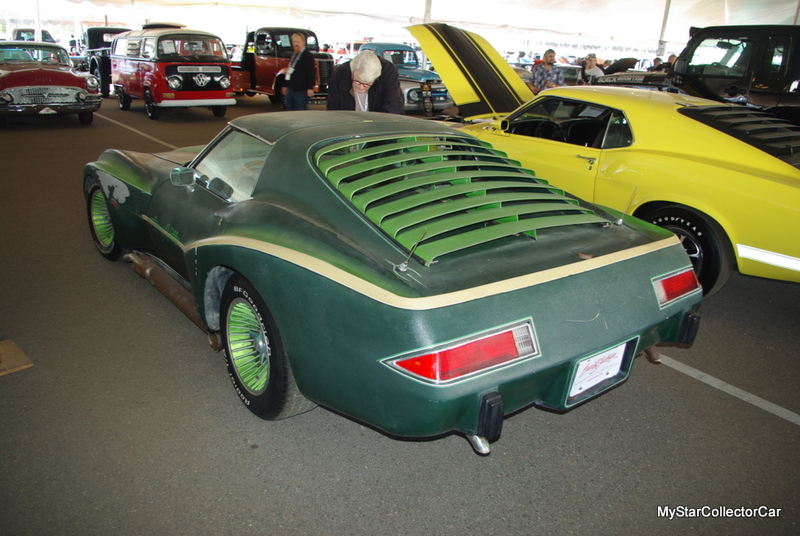 Here’s a back end shot of the car in question—that’s a switch from the usual front end perspective. 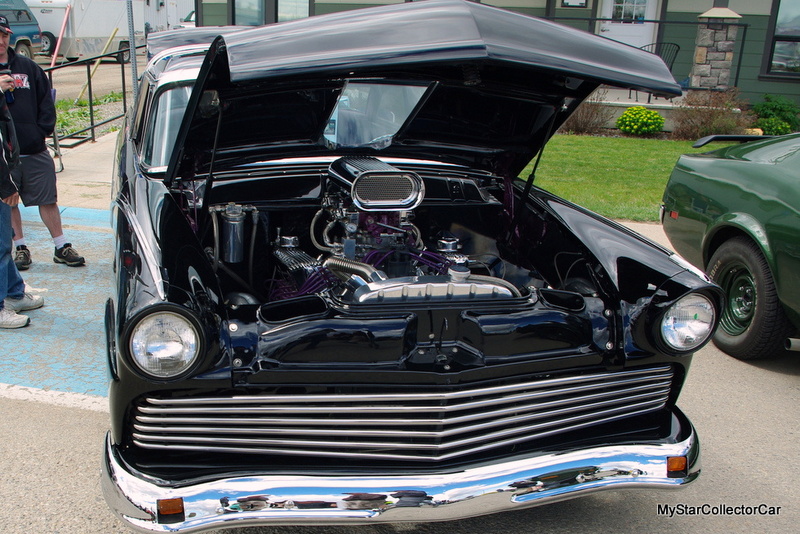 Here’s the front end—did that help? 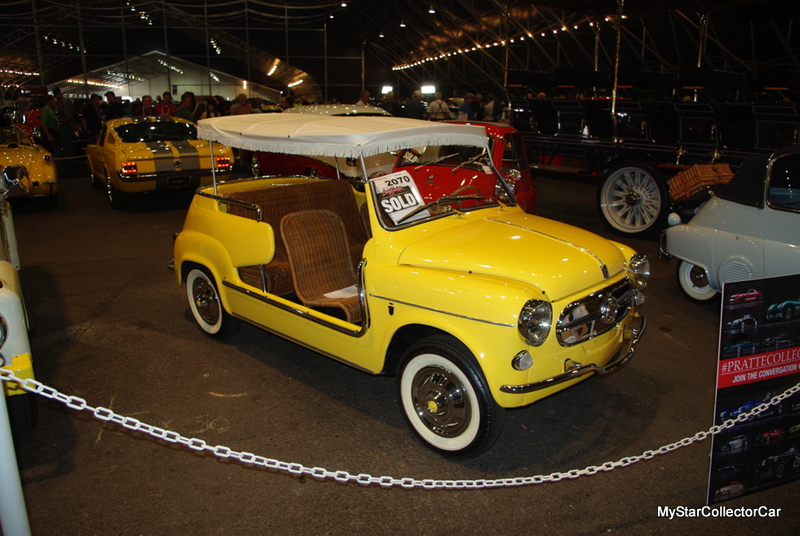 It’s a 1959 Fiat Joly. 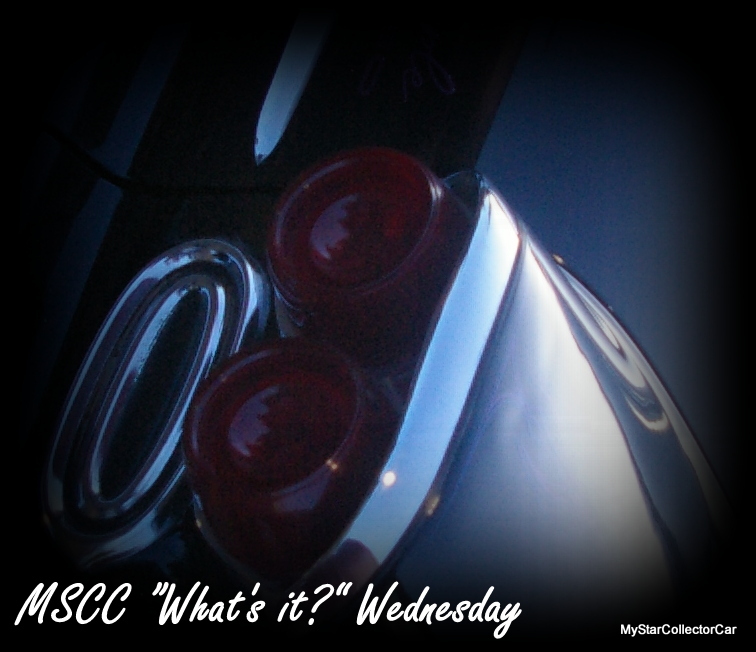 MSCC “What’s It?” Wednesday is supposed to be a bit of challenge so you don’t get too many clear views of the car or truck. 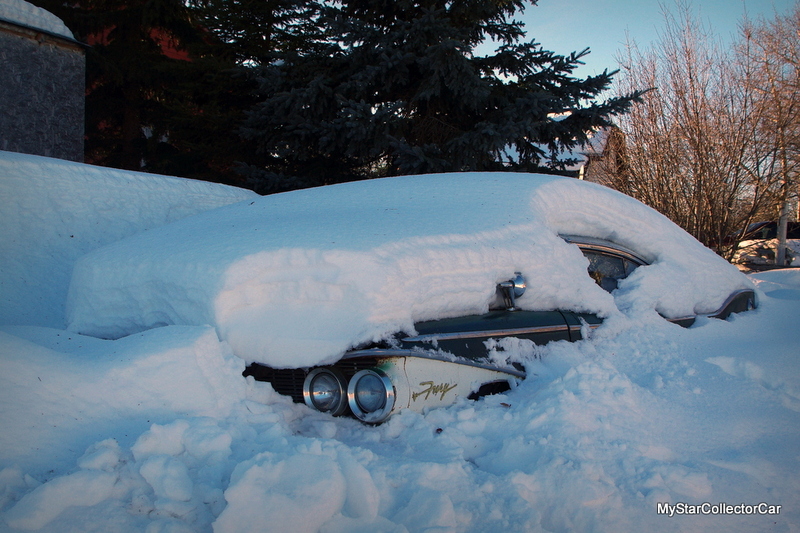 This is an exception—check out the crystal clear view of the back of the car. Did the clues ring any bells? If not—look below tomorrow or do some research. 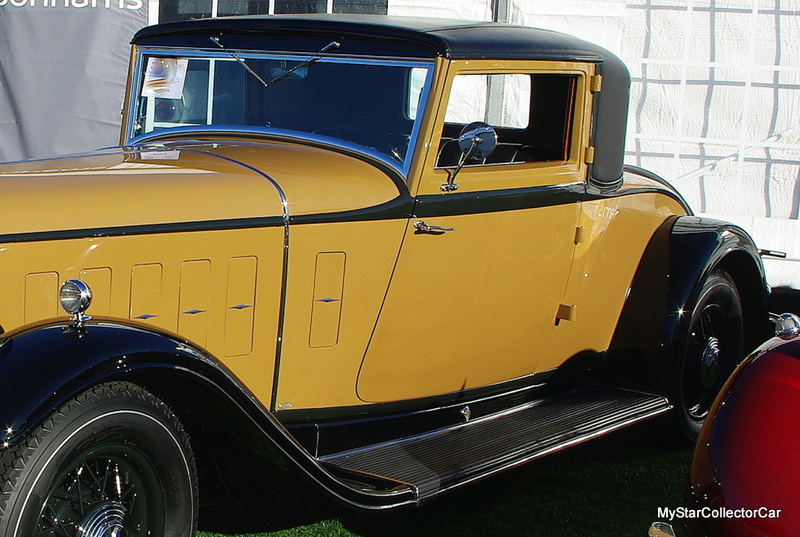 It’s a 1932 Lincoln KB Custom Coupe. MSCC AUGUST 30 “WHAT’S IT?” WEDNESDAY—YOU GET THE FRONT AND THE BACK OF CAR SO HOW CAN YOU MISS? 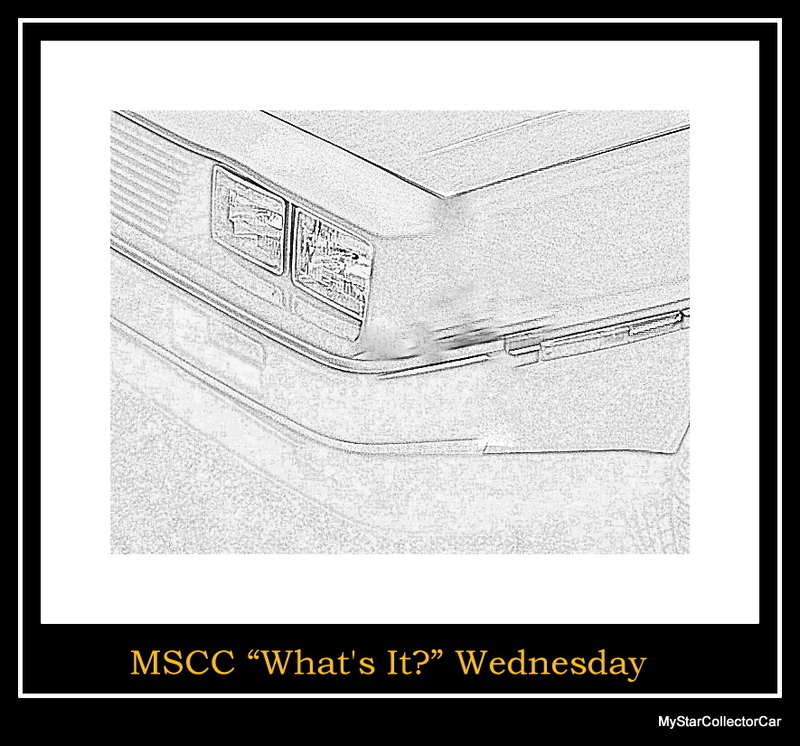 MSCC “What’s It?” Wednesday generally gives one side of the car—front, back or side but that’s not a hard and fast rule so the first clue is from the front. 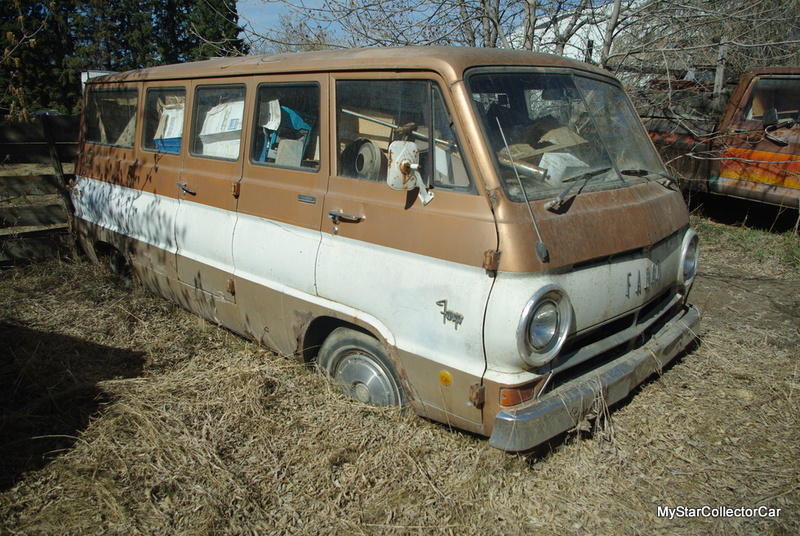 Here’s the back of the vehicle. If this doesn’t help then check back tomorrow. 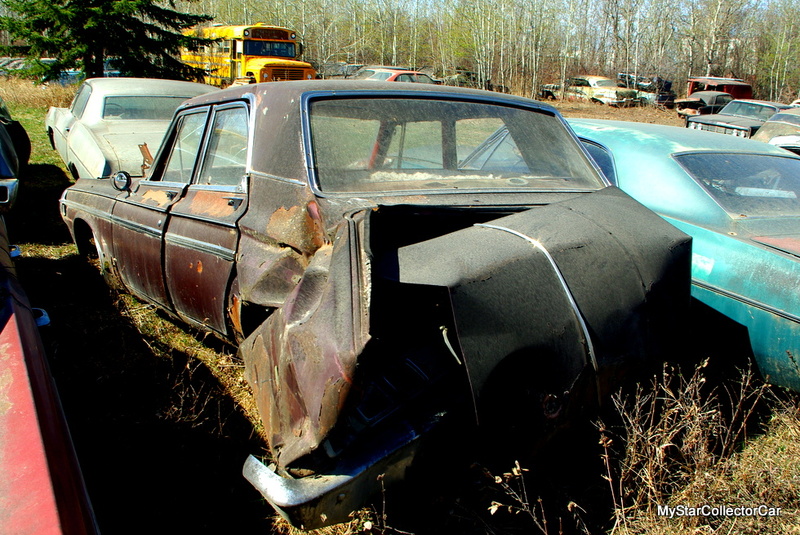 It’s a ’66 Dodge Polara. 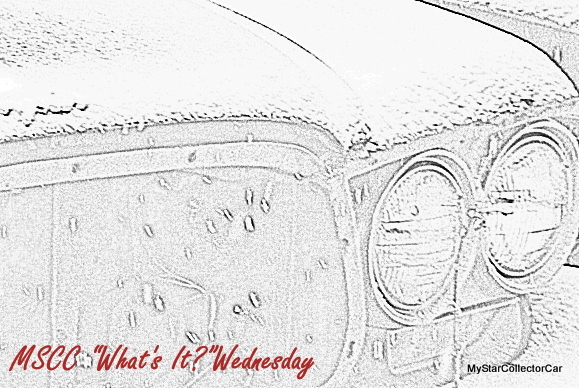 Last week’s “What’s It?” Wednesday rat rod was too much of a reach for MSCC readers so this week’s is a whole factory car—it’s just under some snow. 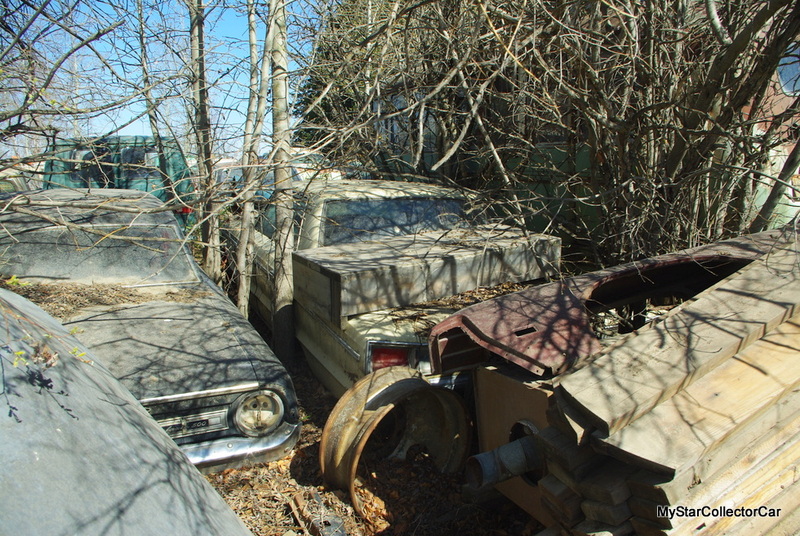 Here’s another piece of the puzzle at the rear of the car along the deck. 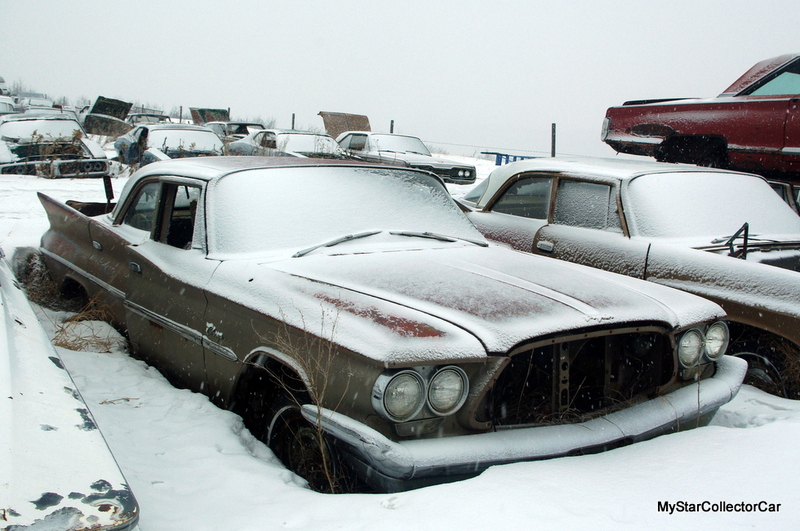 Snow got you down in August? The answer will show up tomorrow. 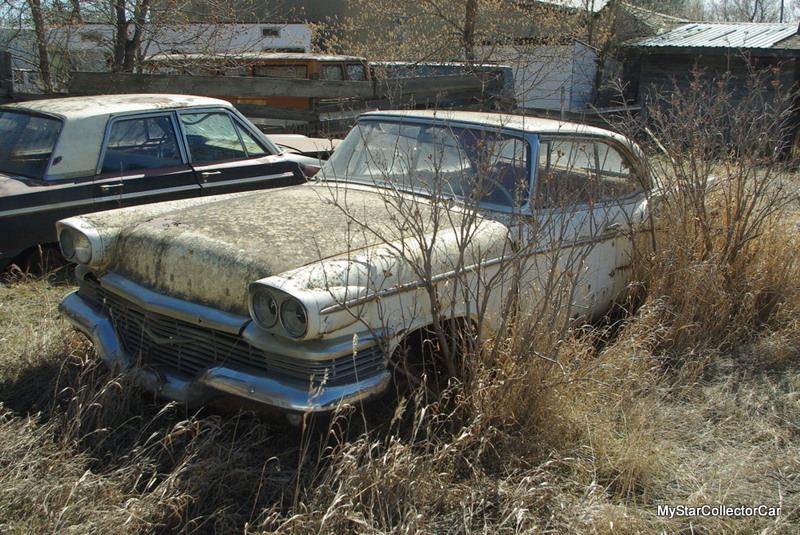 It’s a 1960 Plymouth Fury. MSCC AUGUST 16 “WHAT’S IT?” WEDNESDAY—AN EASY ONE? 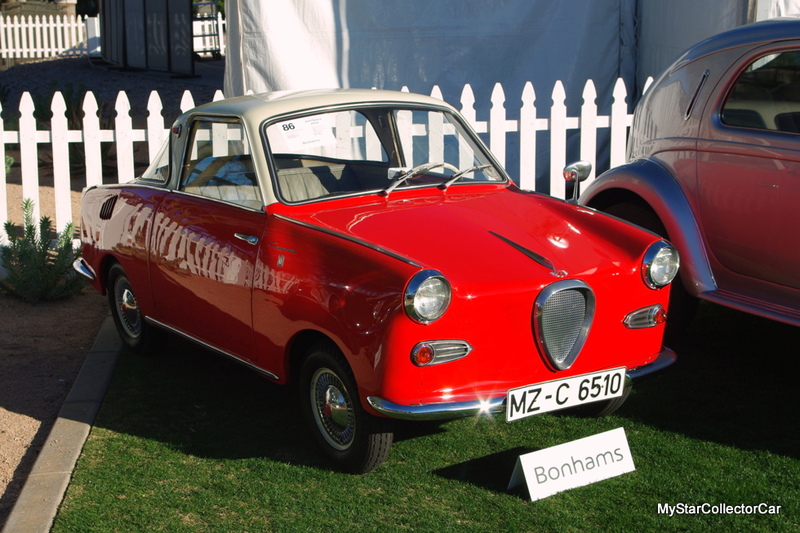 This one should be a puffball for car guys. 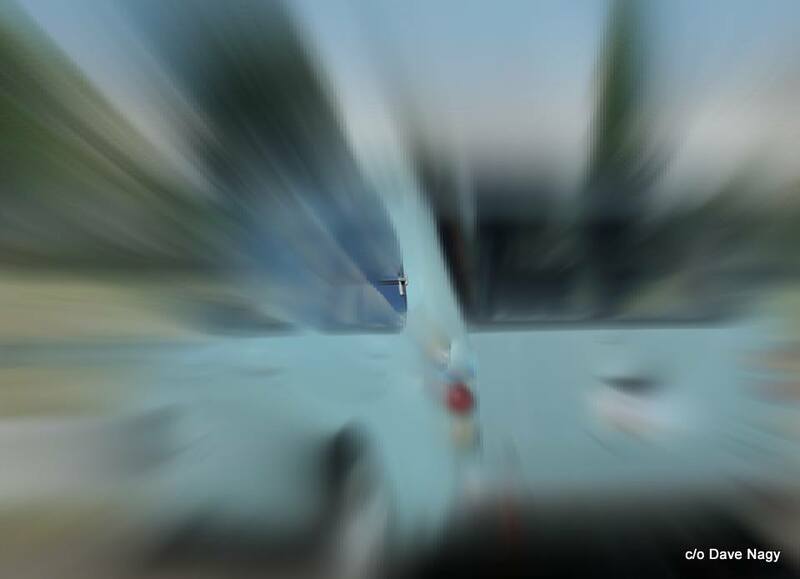 Maybe this 2nd clue is all you need. Stumped for an answer? 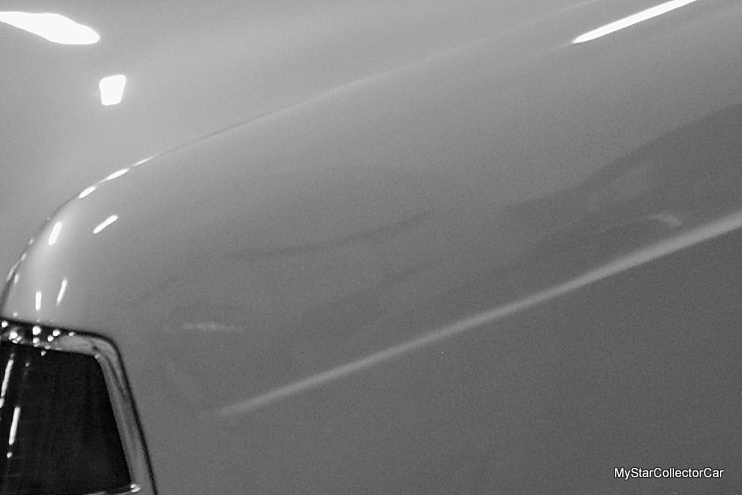 Check back here tomorrow for a full picture and a description. 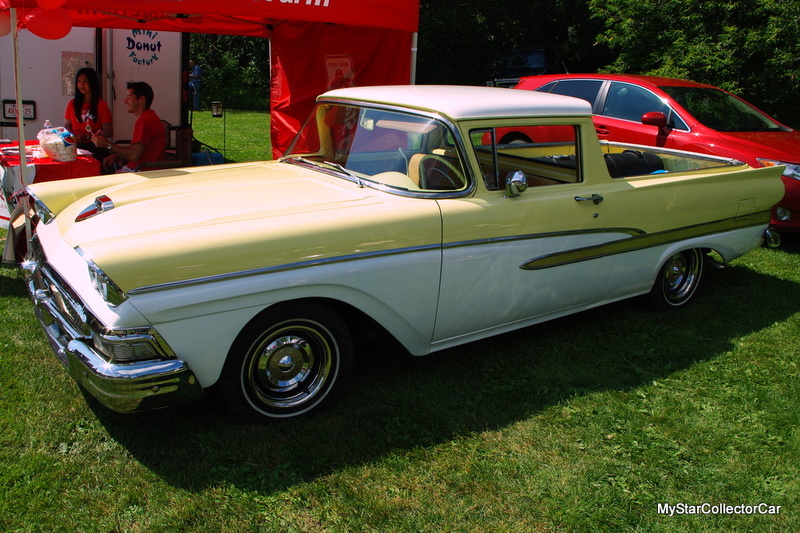 Trick answer-39 Chevy truck with ’59 Cadillac fins. 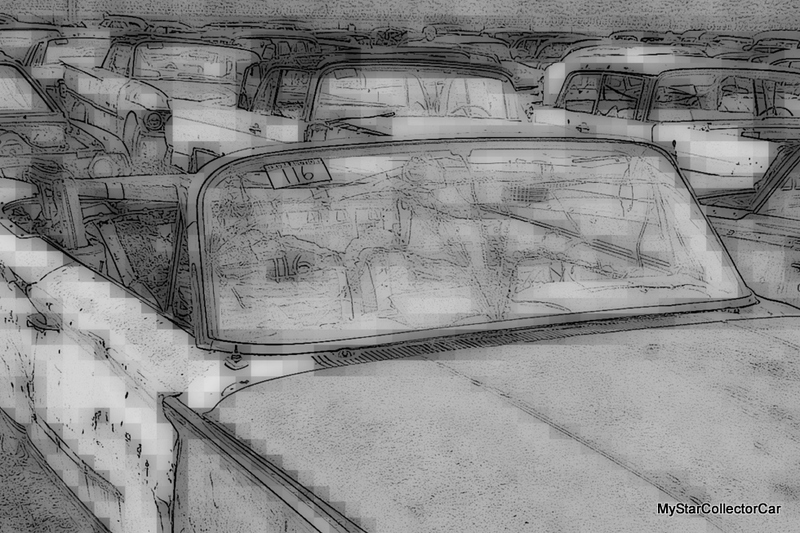 The last few MSCC What’s It? 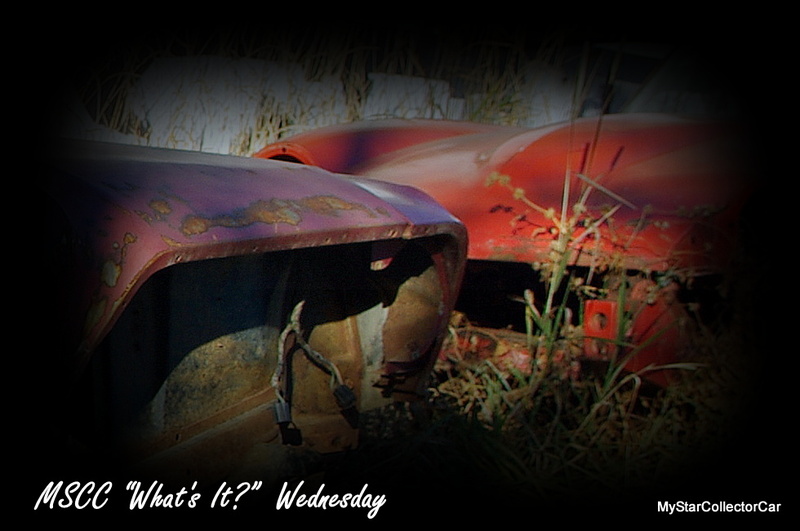 Wednesday vehicles have been pretty tough so this time you get a clear look at the old classic. 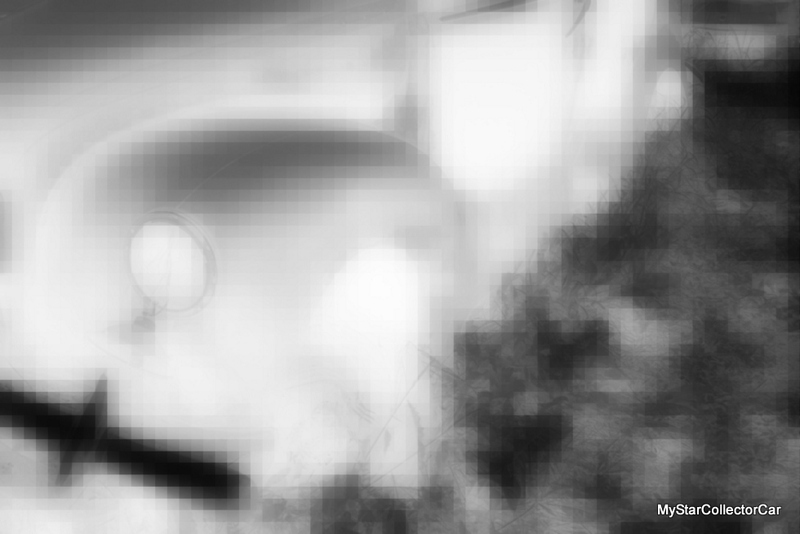 Here’s a full, unobscured picture but if that (or Google) doesn’t help you’ll see the answer on Thursday. 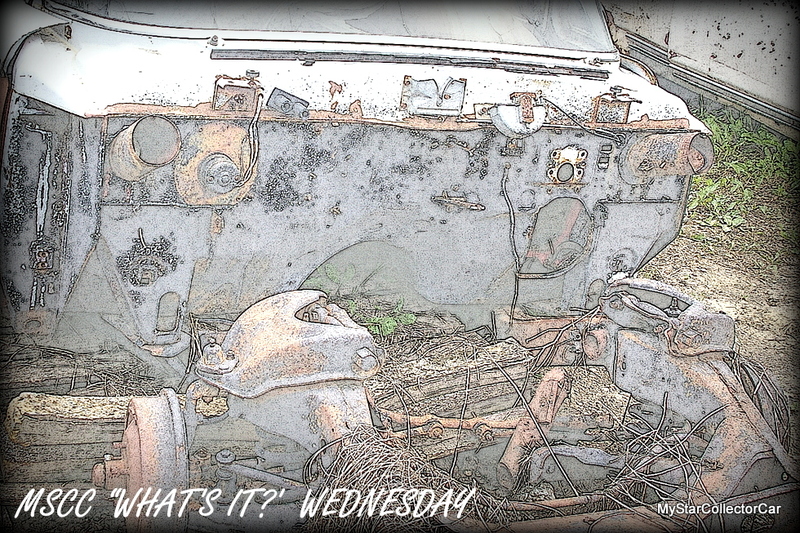 The basic premise behind “What’s It?” Wednesday is to obscure some of the picture to make identifying the old car or truck a challenge. Most of the time this involves cropping the picture but this time you get the whole picture. If that didn’t help then the actual picture won’t help much but there will be an answer below the picture tomorrow. 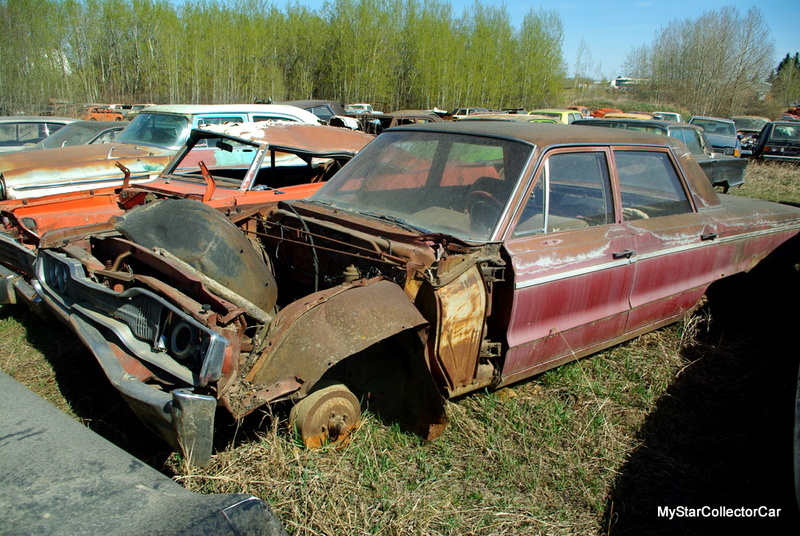 Some cars are completely unrecognizable when they’re missing a few parts. That makes them a good candidate for What’s It? 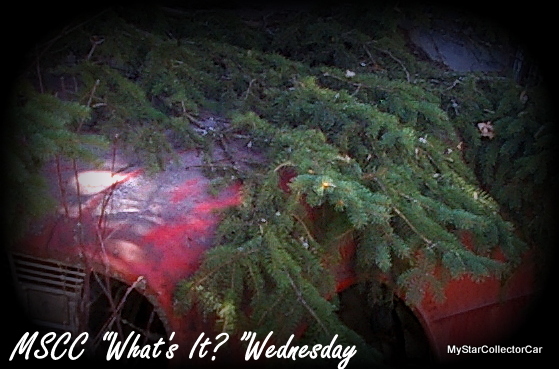 Wednesday-maybe this second clue will help. 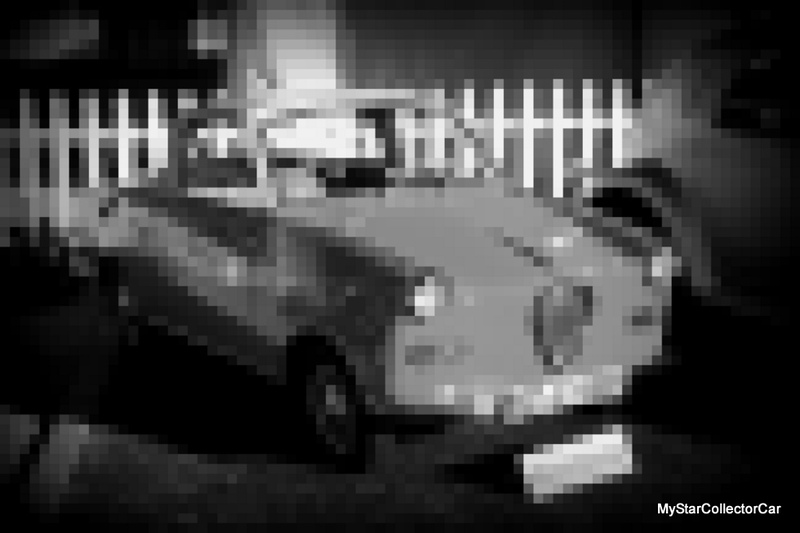 Okay-maybe that didn’t work so check back here tomorrow for a clear picture and a final answer. 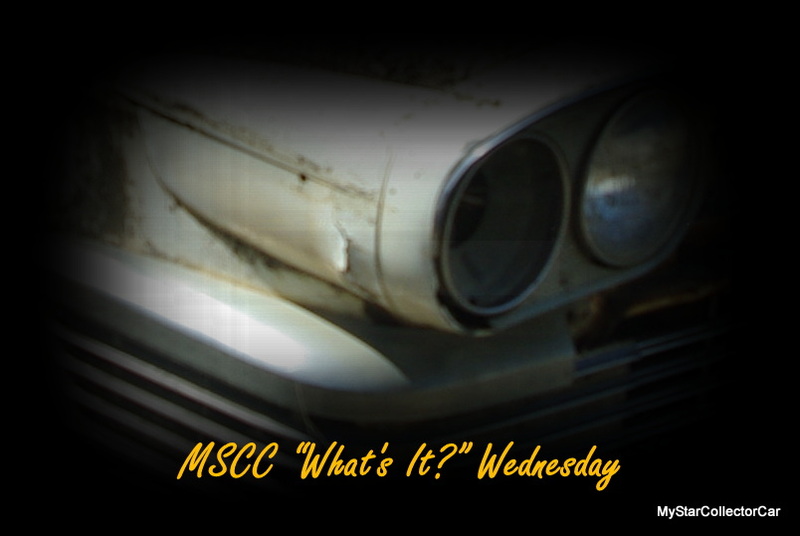 Today’s MSCC “What’s It?” Wednesday picture hasn’t had too many games played with it. 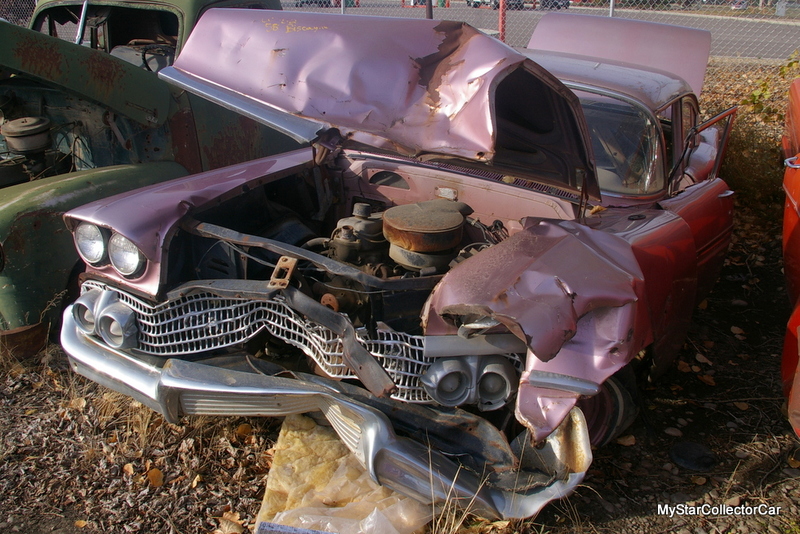 There’s a clear shot of the trunk and you can make out a taillight – the crash part was literally by accident, not design. 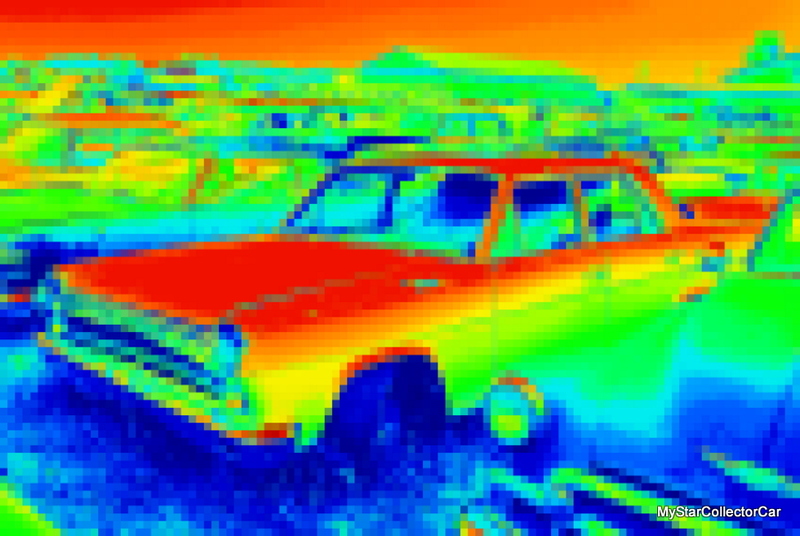 Here’s a shot of the roof line—that’s fair right? Stay tuned tomorrow for the answer if neither of these clues help. 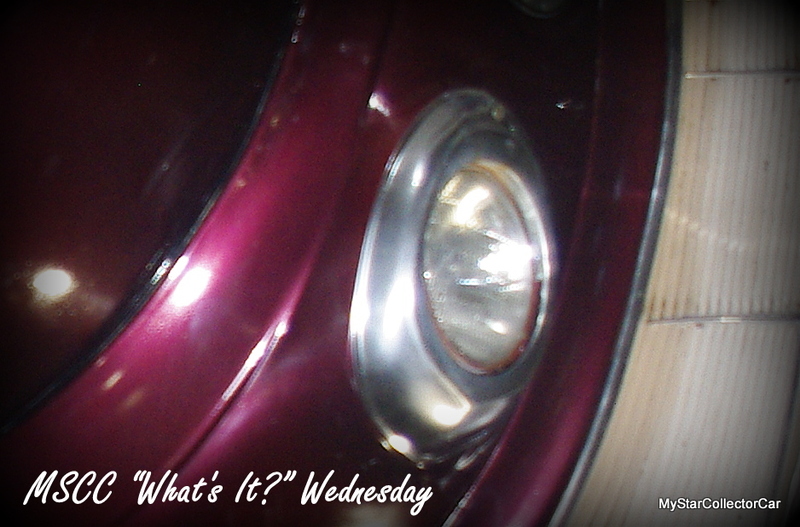 This is one of those “What’s It?” Wednesday clues that looks easy because there’s a fair amount of detail. 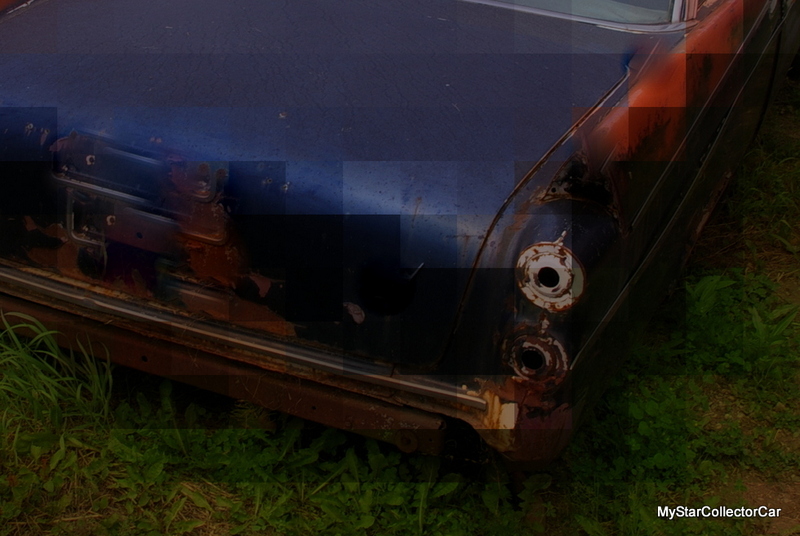 This second clue could be the one to steer you to the answer. Maybe it wasn’t that obvious so if you need the answer come back tomorrow. 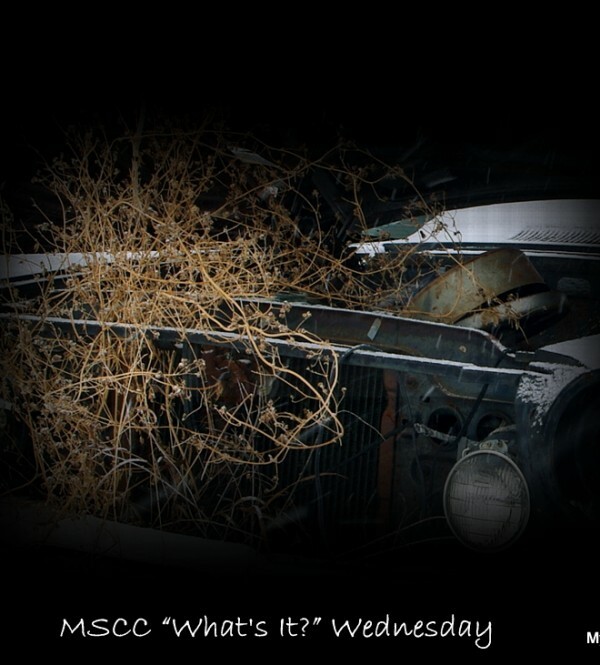 MSCC “What’s It?” Wednesday is designed to be a challenge but to some it’s an instant solution. 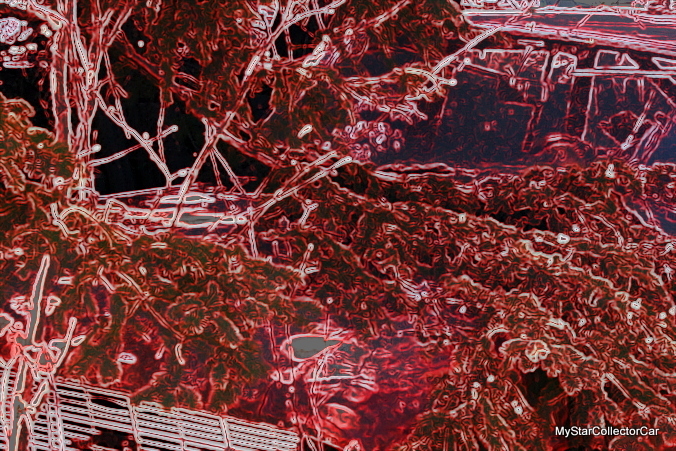 This is one of those because if you know what this is, you’ll have it in a nanosecond. 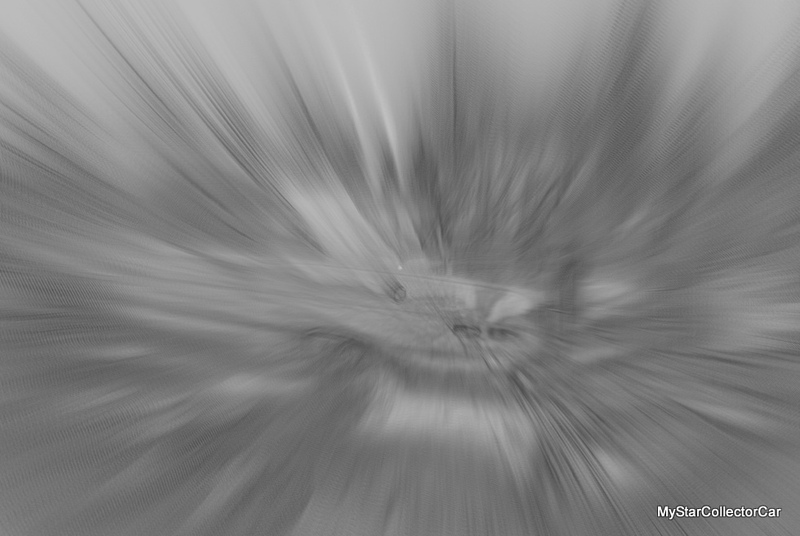 Or you’ll need two nanoseconds and this second clue. Or you’ll need to come back tomorrow. 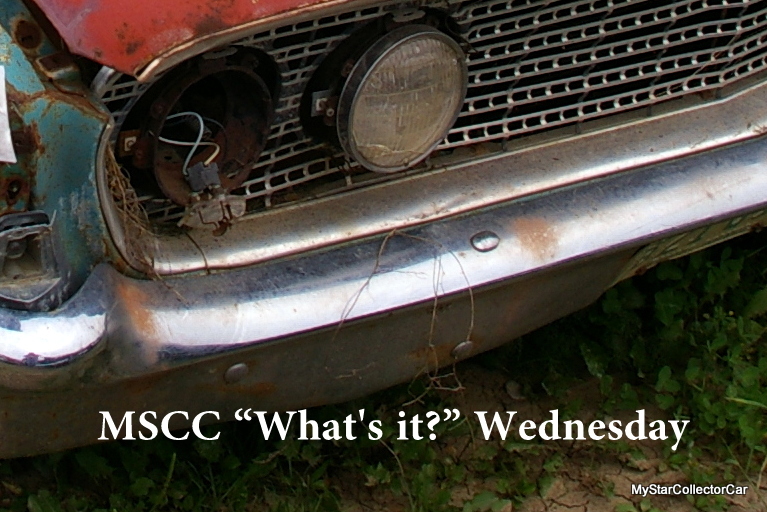 MSCC JUNE 28 “WHAT’S IT?” WEDNESDAY—ARE YOU GOOD ENOUGH TO ID A FIREWALL? 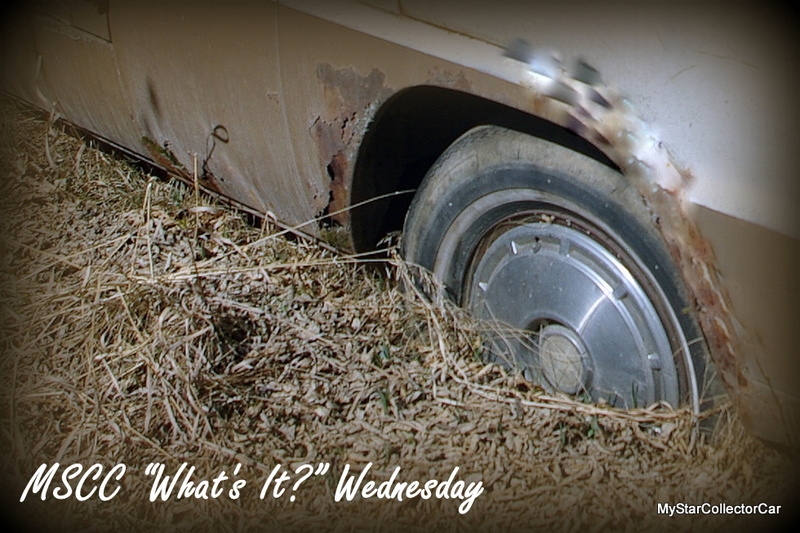 There have been many versions of “What’s It?” Wednesday to date but this is the first one that features a fairly clear version of a firewall. Maybe this 2nd clue will tie it all together. If not—come back tomorrow for the answer. 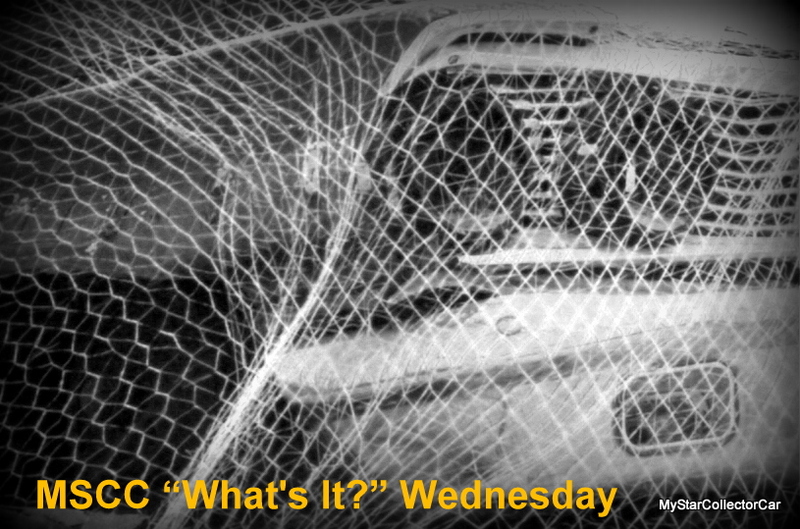 Nothing is exactly as it seems in MSCC “What’s It?” Wednesday. 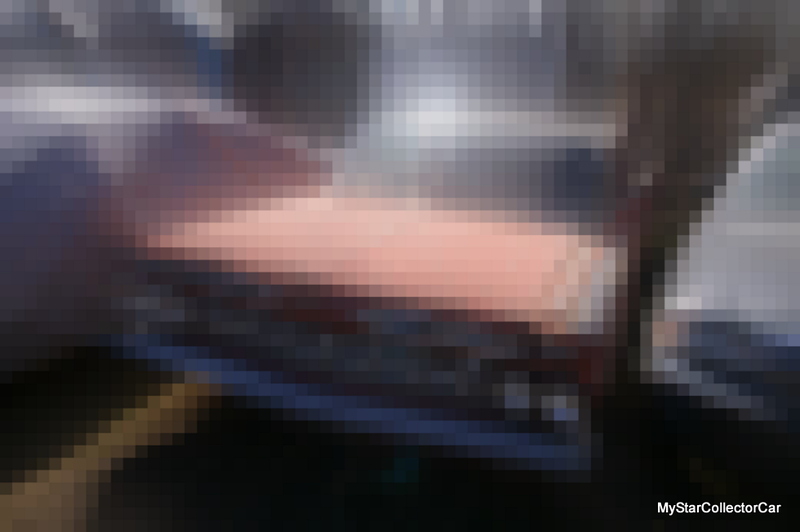 Despite the obvious attempts to obscure and give an odd perspective on a vehicle a number of very astute MSCC readers get the correct answer almost every time so maybe this second clue will be the winner. If not-check back here on Thursday. 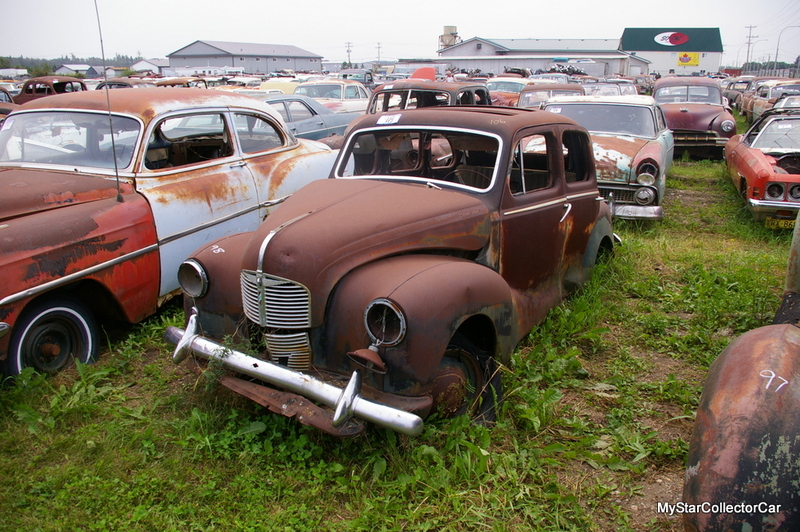 It’s a ’36 DeSoto Airflow. 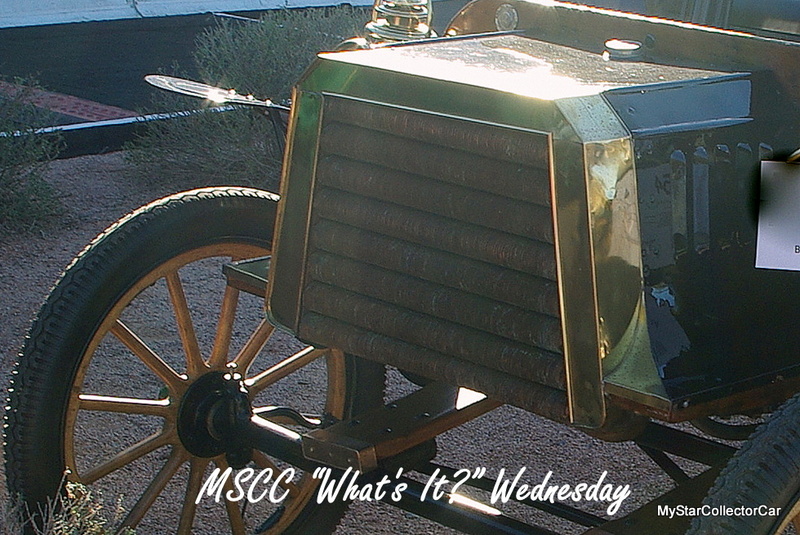 Today’s MSCC “What’s It?” Wednesday is pretty typical—it’s not a great picture. 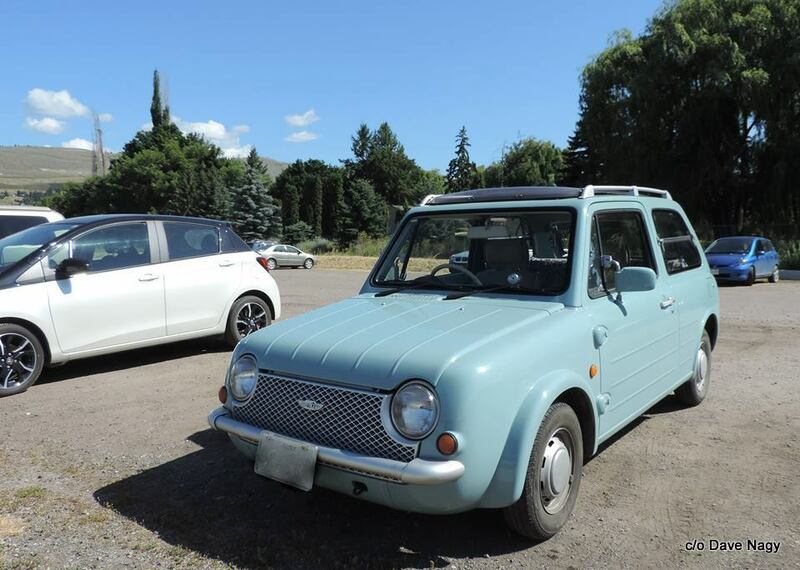 If it was easy to ID these classics then everyone would do it so we all need a challenge. If all else fails, check below tomorrow for the answer. 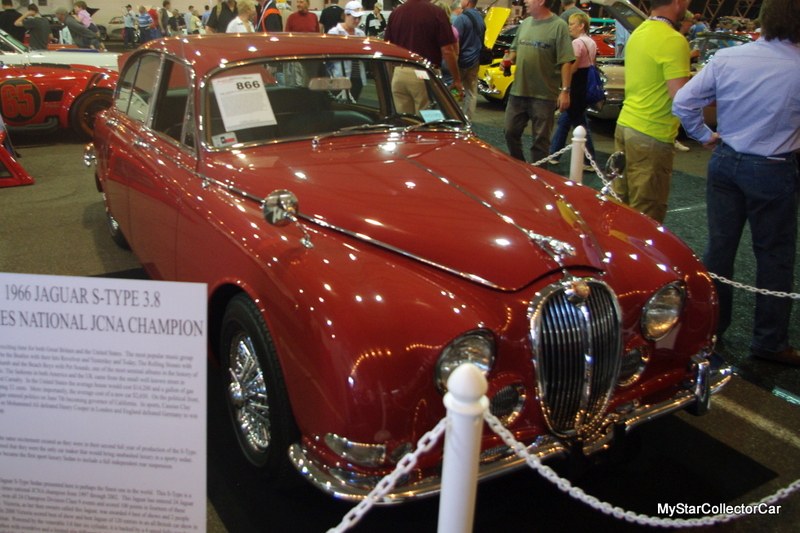 This is actually a pretty common car by hobby standards. 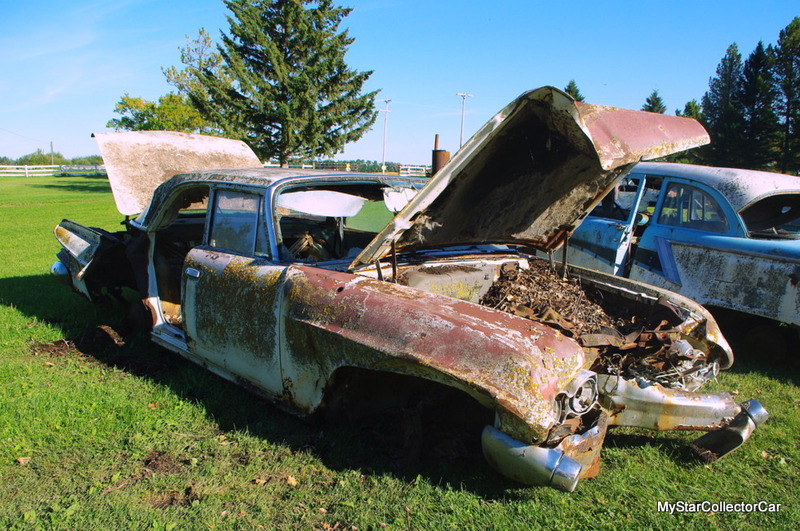 The problem is it was crashed many years ago so you have to deal with the aftermath to ID this car. 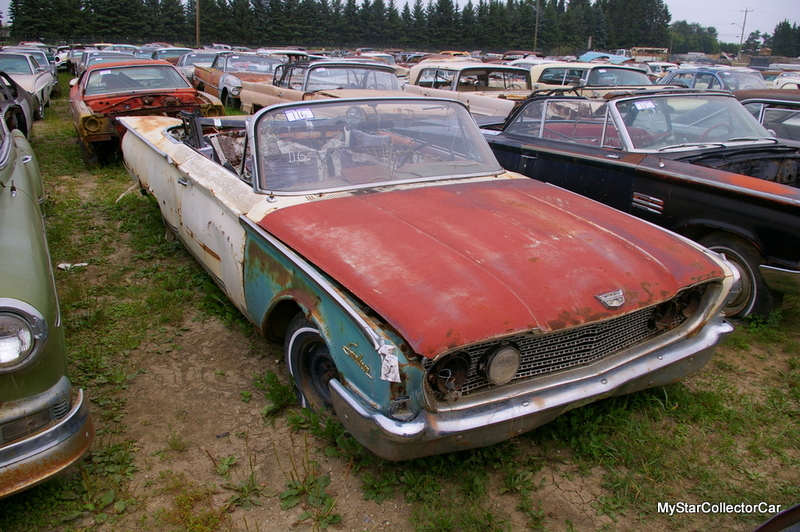 It’s a Thunderbird from the “Flairbird” era. 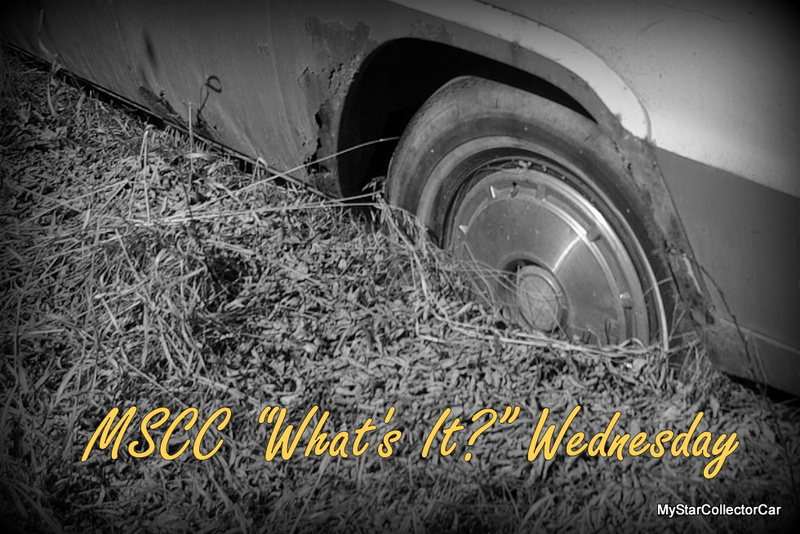 There’s a really good way to make an MSCC “What’s It?” Wednesday guess a lot more difficult—pile stuff on the vehicle. 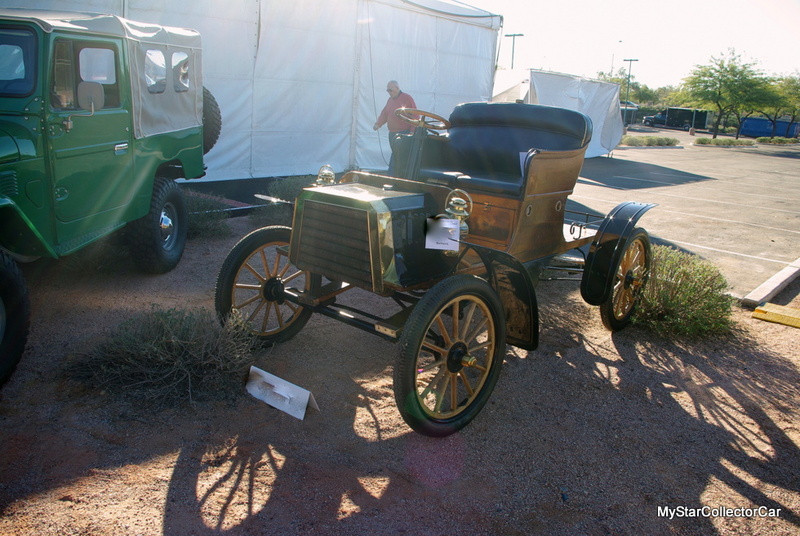 Here’s another look – maybe it’ll help. 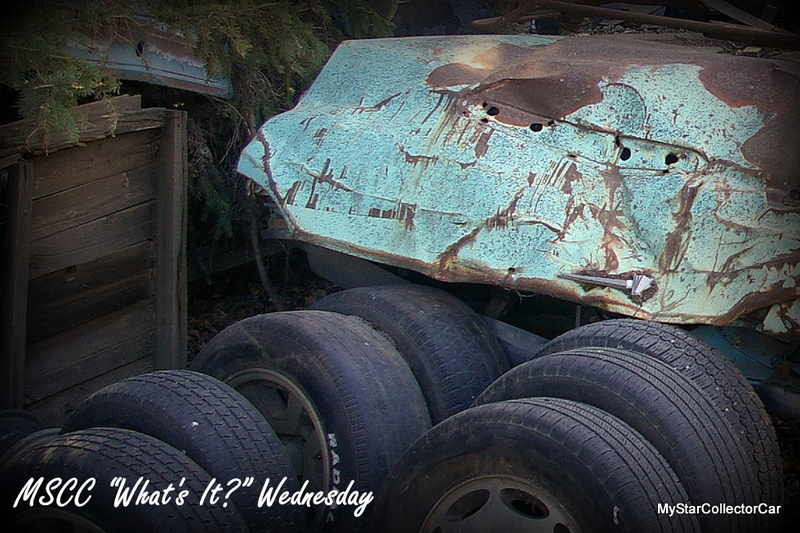 Check back tomorrow for a clear picture—the junk will still be there but the answer below the picture should really help. 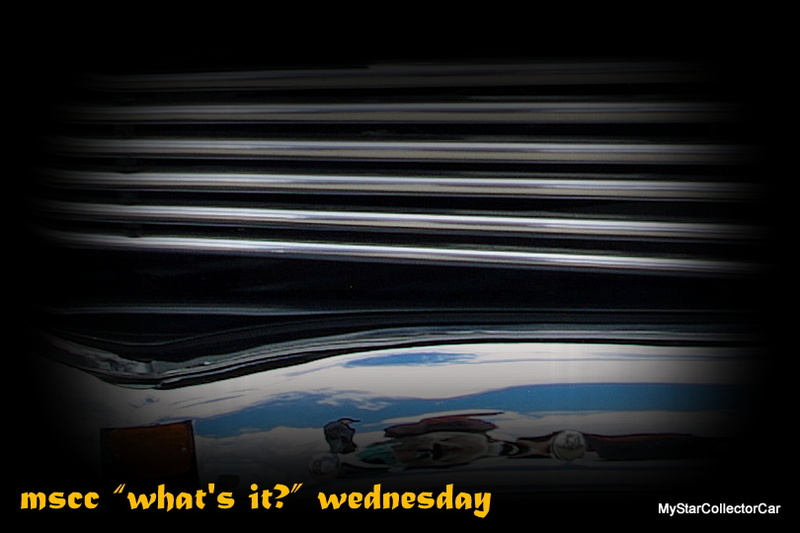 Most of the “What’s It?” Wednesday rides are based on distorted pictures but this time you’ll get a clear view of the front (above). 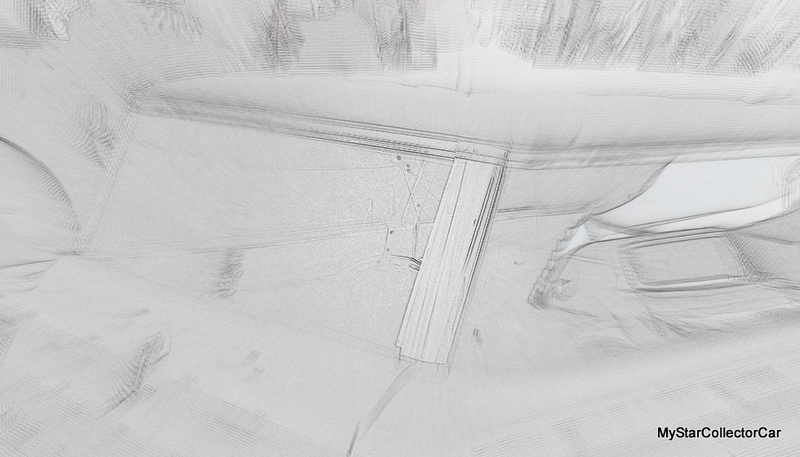 Here’s a clear view of the back half so use your imagination (or a good editing program) and piece the two together. 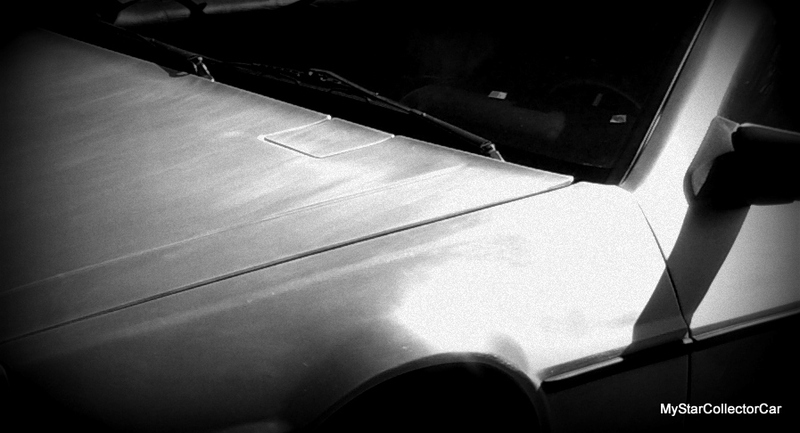 Look for a full view of this mystery ride tomorrow. 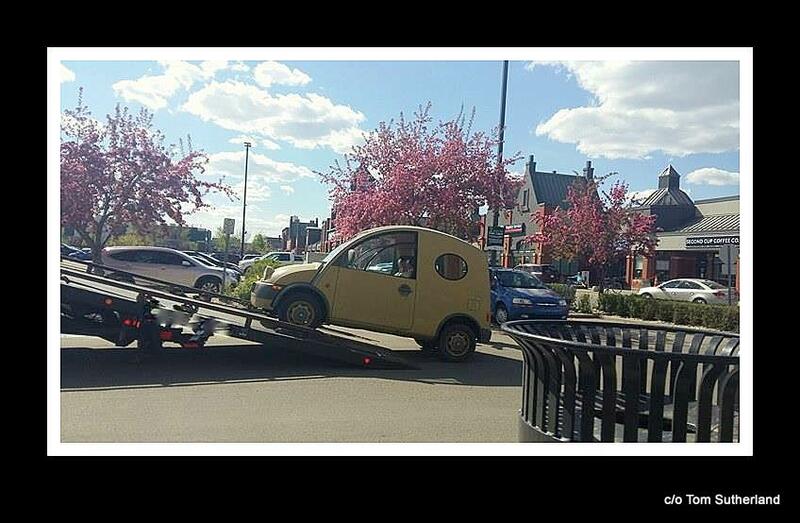 It’s a Nissan S Cargo van. 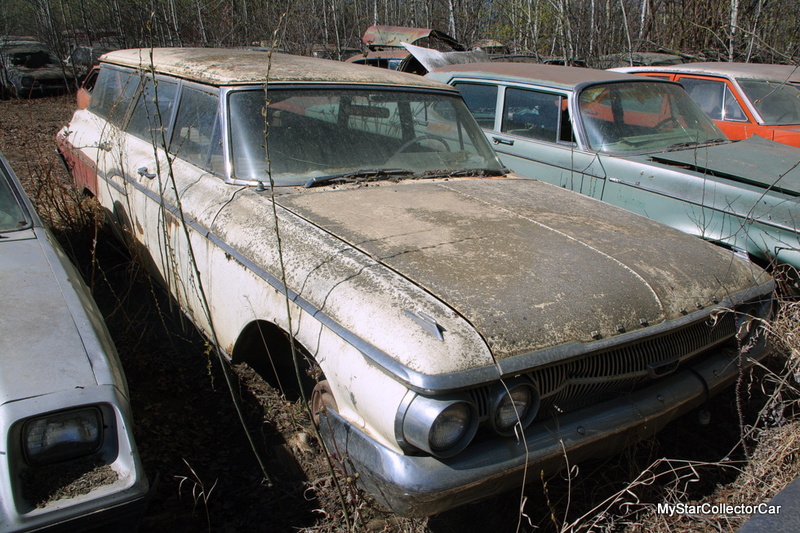 Most car guys look for obvious clues with old iron and one of the biggest clues is found in the grill. 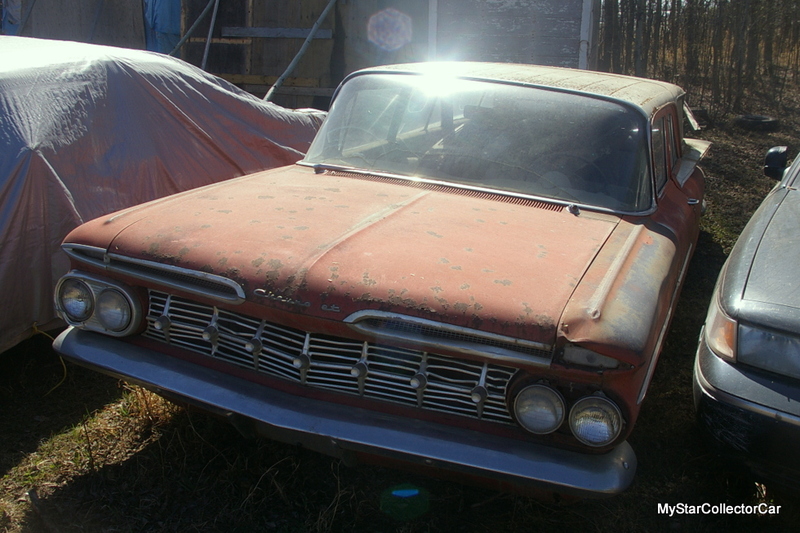 That won’t help because this beauty has a custom grill—here’s another clue. 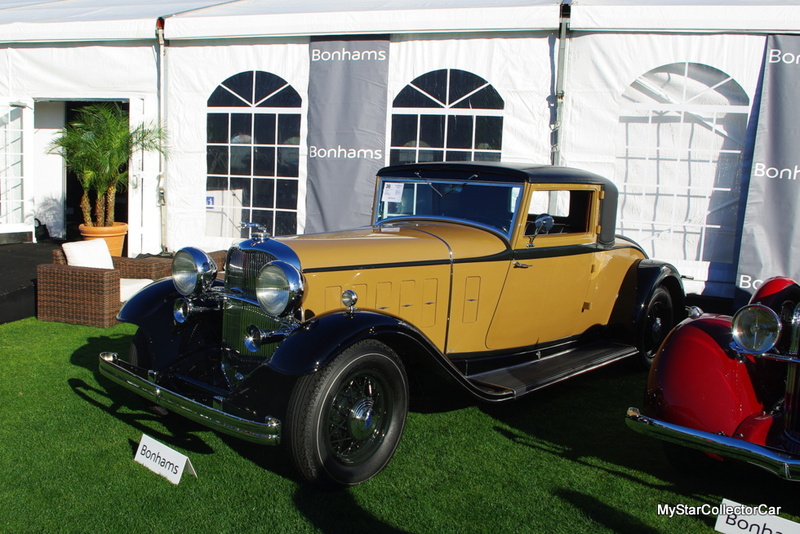 Come back tomorrow if you can’t ID it-you’ll find the answer below. 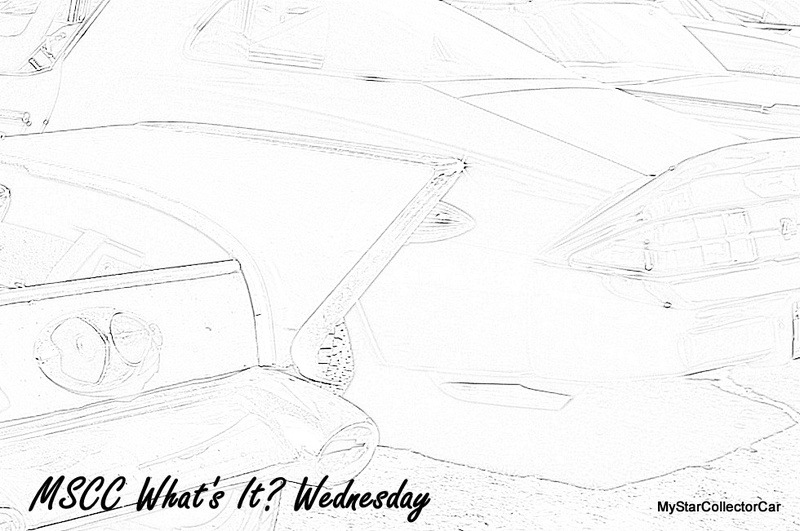 “What’s It?” Wednesday is designed to be solvable with varying degrees of difficulty. 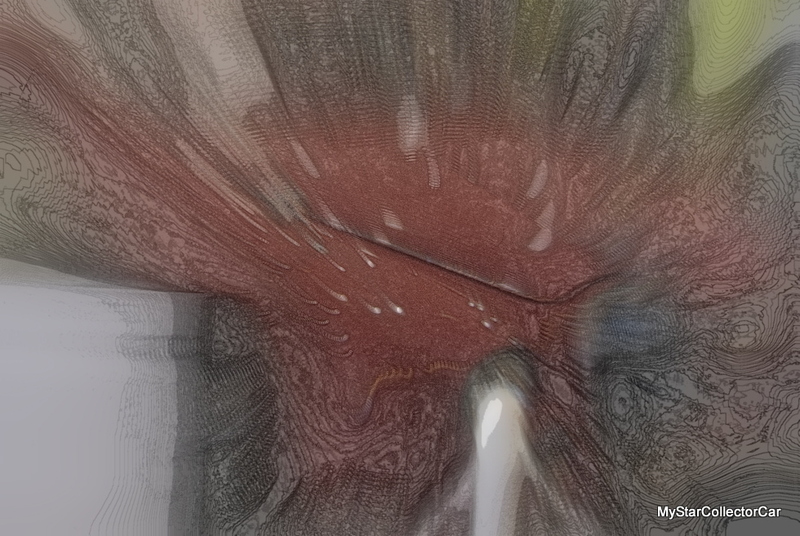 This one may be at the higher end of the difficulty scale but if you put the first clue and this second clue in context you should figure it out. If not—come back tomorrow for the solution. You’ll find it below. 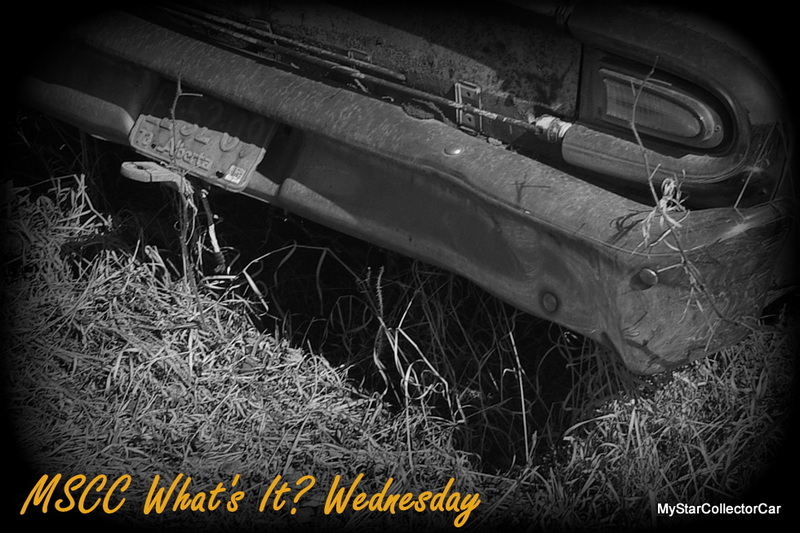 Last week’s clues made it relatively easy to solve “What’s It?” Wednesday and this week’s test could be the same if the first clue gives you a big advantage. 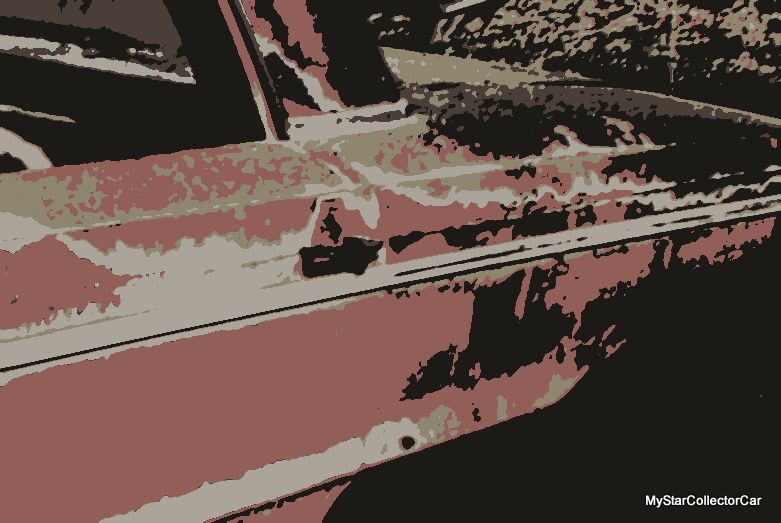 Maybe this 2nd clue will give you a better route to analyze the overall configuration of this classic. If not-come back tomorrow—you’ll find the answer below. 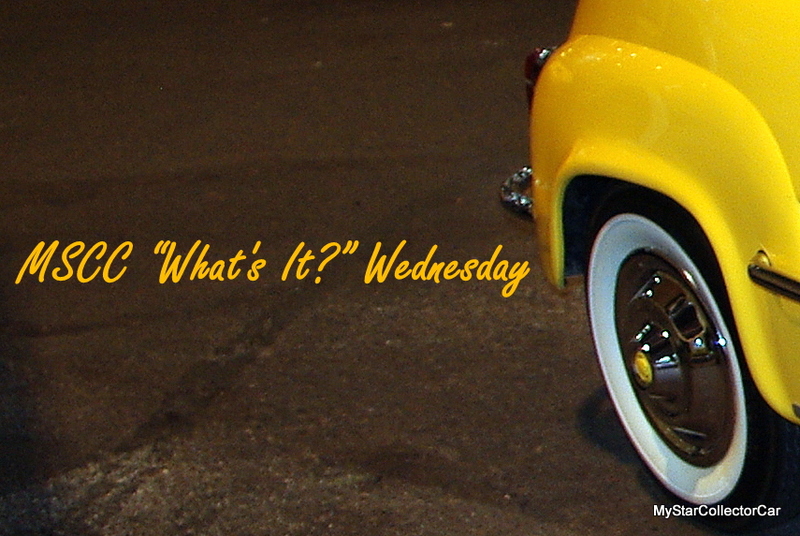 There are always two clues in “What’s It?” Wednesday and typically you should get it on the first clue. If not there’s always a second clue like this one. If not check back here tomorrow. 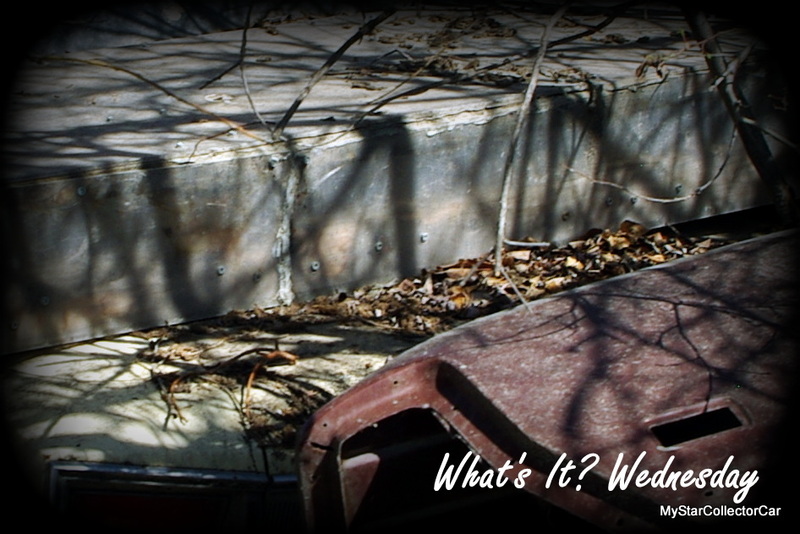 Last week’s “What’s It?” Wednesday proved to be a little difficult even with the visual clues. 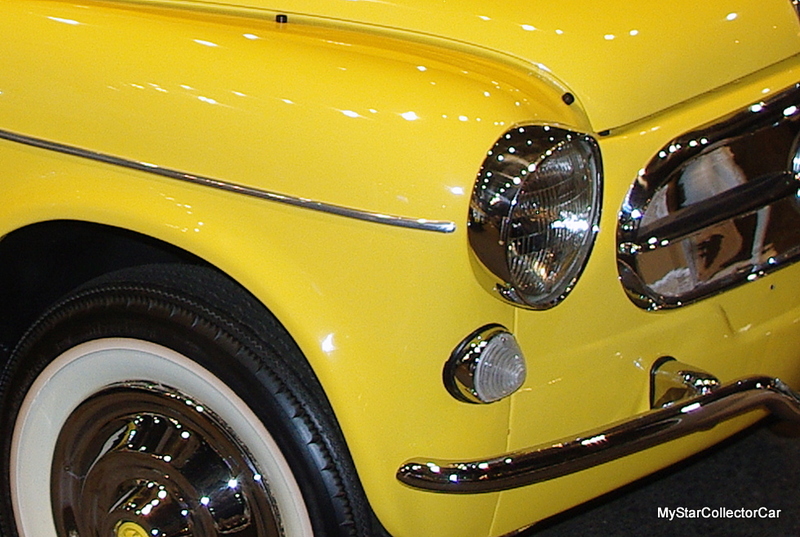 The car was too rare so this week’s vehicle is a very common sight at very show you’ll see in 2017—here’s another clue. 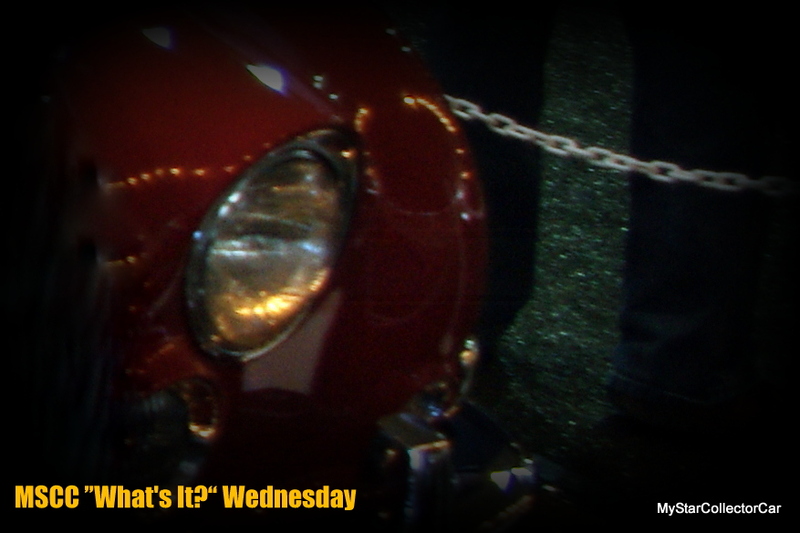 Most of these “What’s It?” Wednesday rides are familiar rides so you’ll see obscure pictures to make the ID a lot tougher. 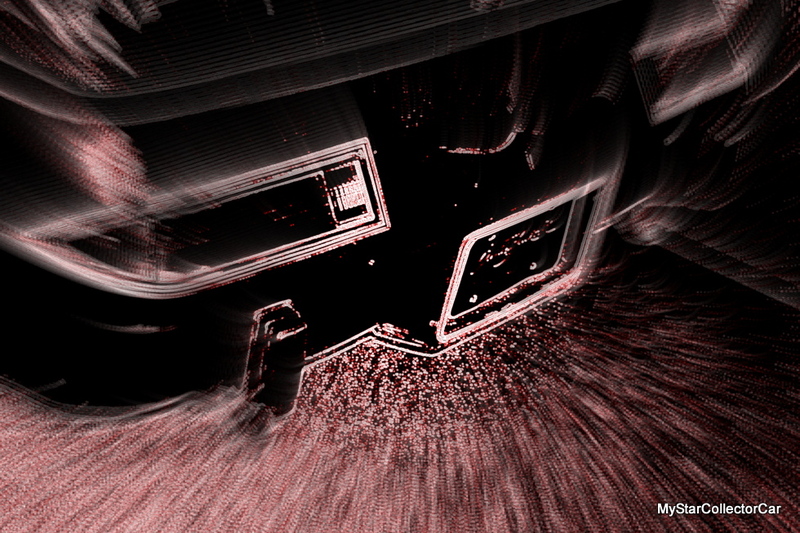 This isn’t supposed to be easy but here’s another clue. If this isn’t enough check back here tomorrow. 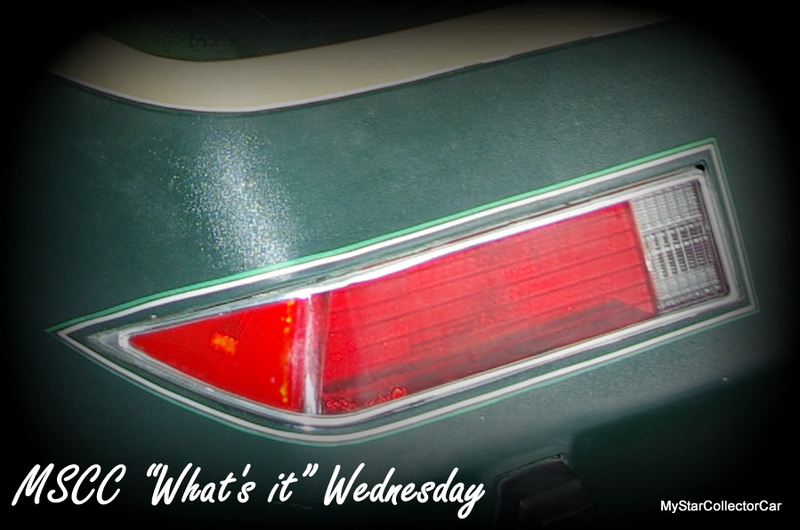 The basic premise of “What’s It? Wednesday is simple—never give the reader a clear shot at the prey. 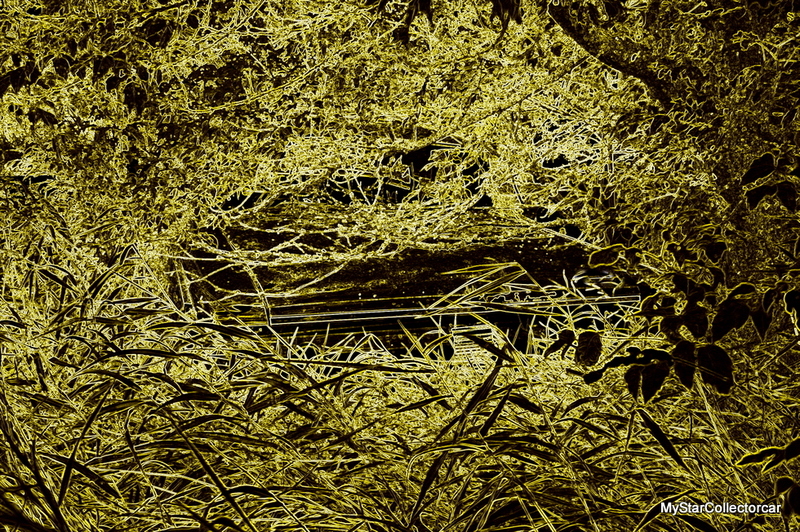 Branches can be a big asset when the game is to camouflage an object but this wider shot may help. If not, come back here tomorrow and you’ll find the answer below. 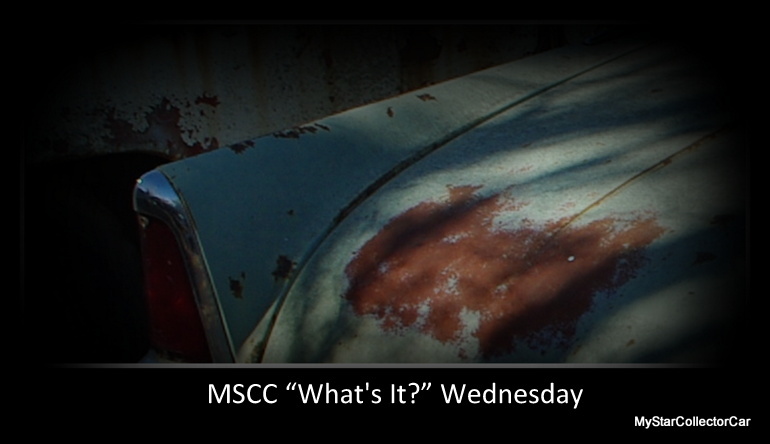 Last week’s MSCC “What’s it?” Wednesday was a little too easy so this one may be a little more of a challenge. If not, check back here tomorrow for the answer. 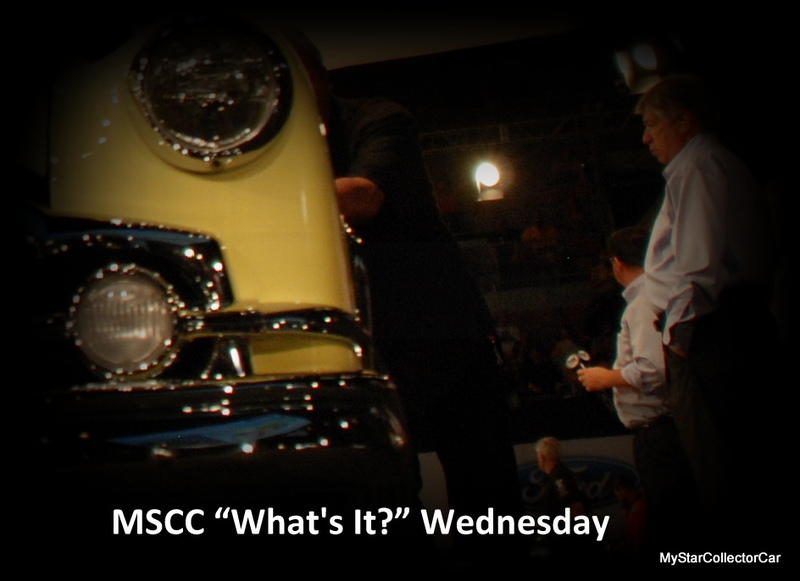 The key to a solution for any MSCC “What’s it?” Wednesday is to add the clues together. 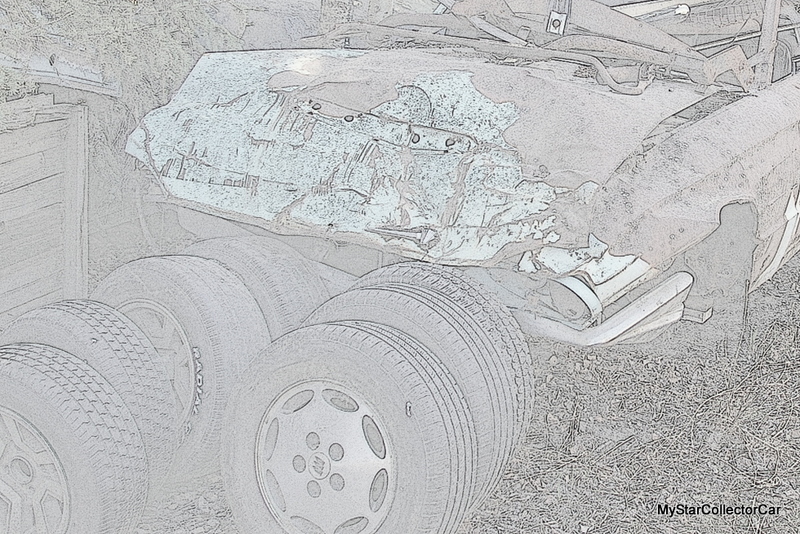 You can look at the first clue then look at this one and hopefully you’ll come up with an overall image. If not look below here tomorrow and you’ll get the answer. 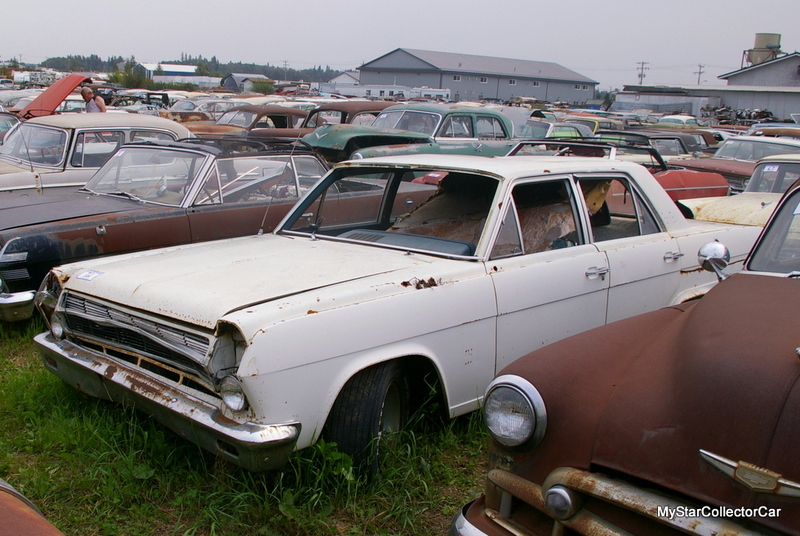 It’s a ’65 Rambler Ambassador. 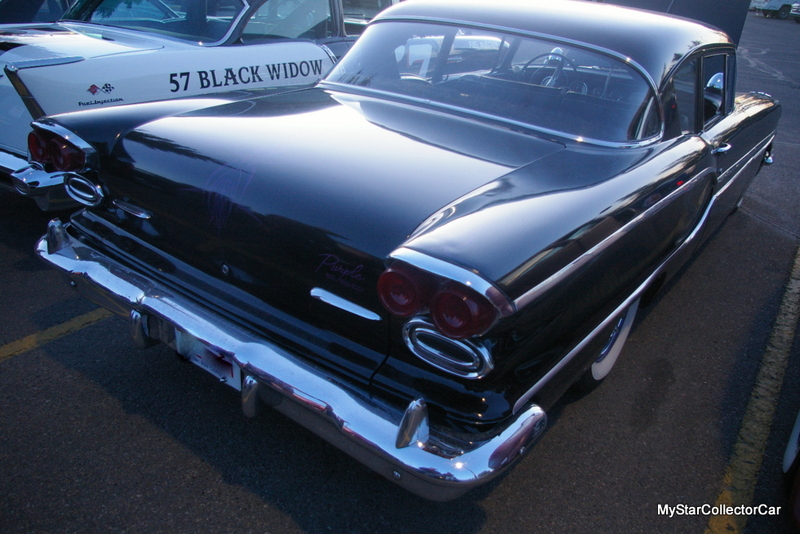 Tail lights are a dead giveaway with most classic rides but do they tell the whole story? 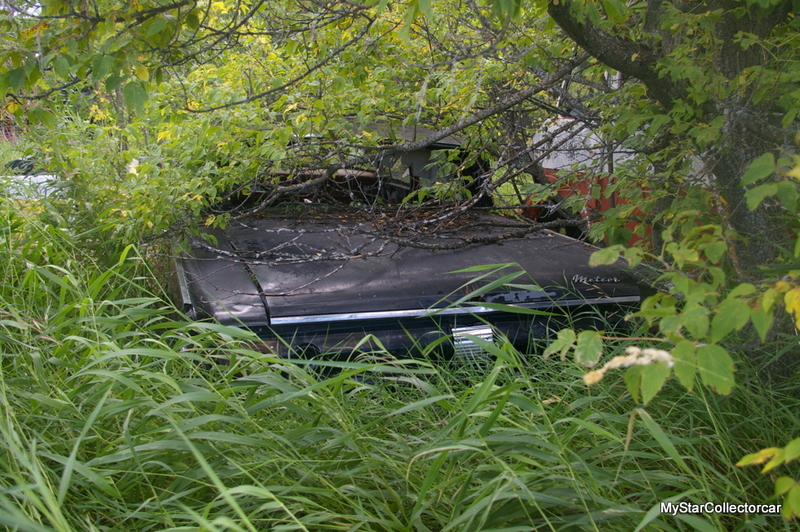 In this case they may seem obvious but here’s another look at the same vehicle. The answer will be here on Thursday. 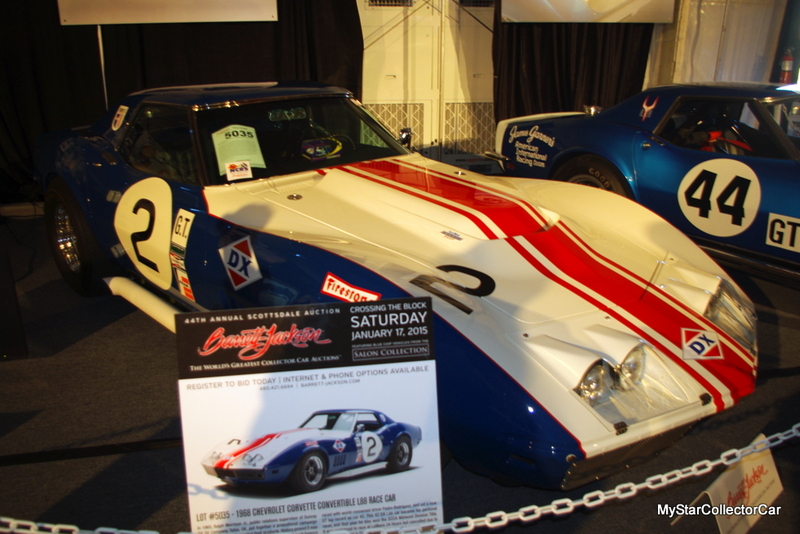 It’s a 1970 Corvette custom built for Farrah Fawcett by the legendary George Barris. 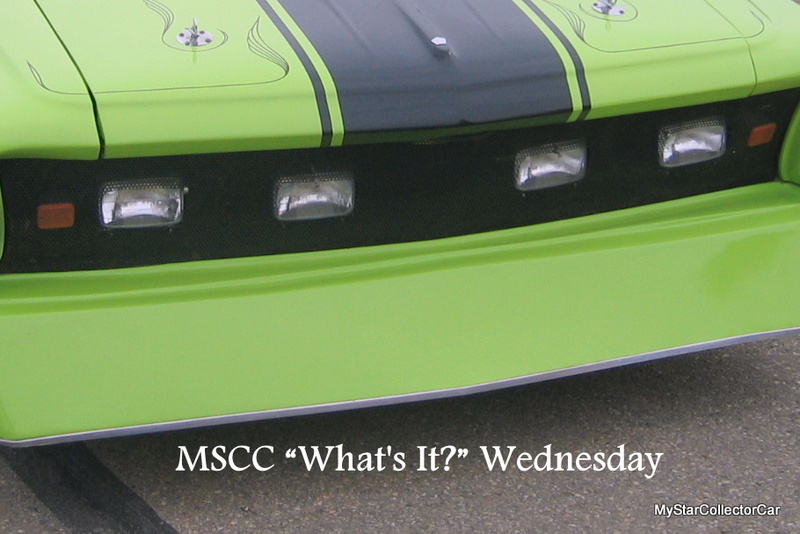 MSCC MARCH 8 “WHAT’S IT” WEDNESDAY—WILL THE SEVERE CUSTOM TOUCHES BE A FACTOR? 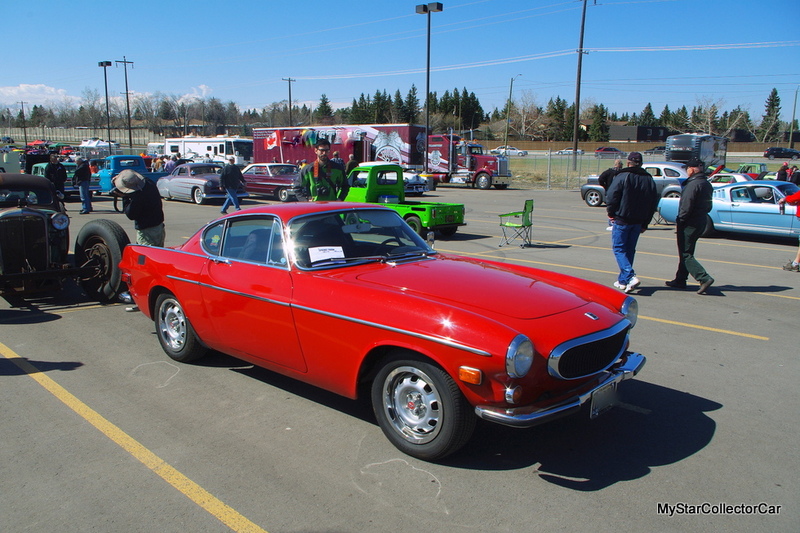 There are customs that barely make a ripple in the look of the car so they’re easily recognizable. 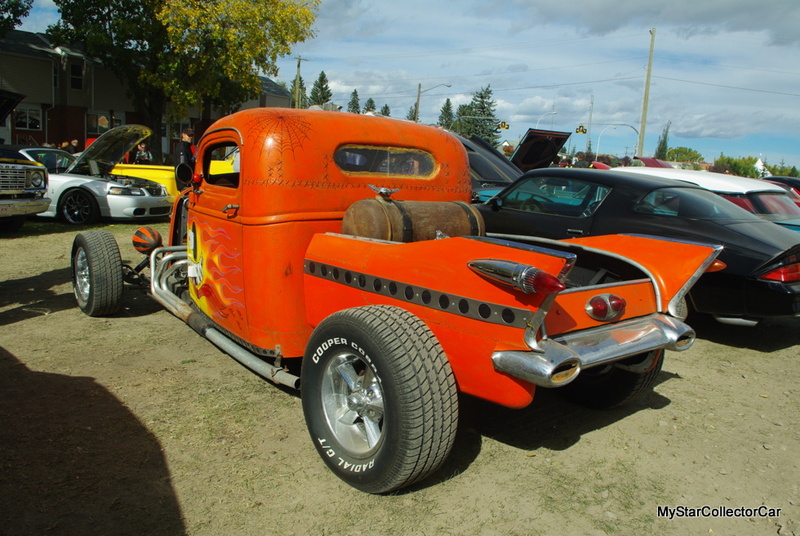 Then there’s the radical custom like this one. 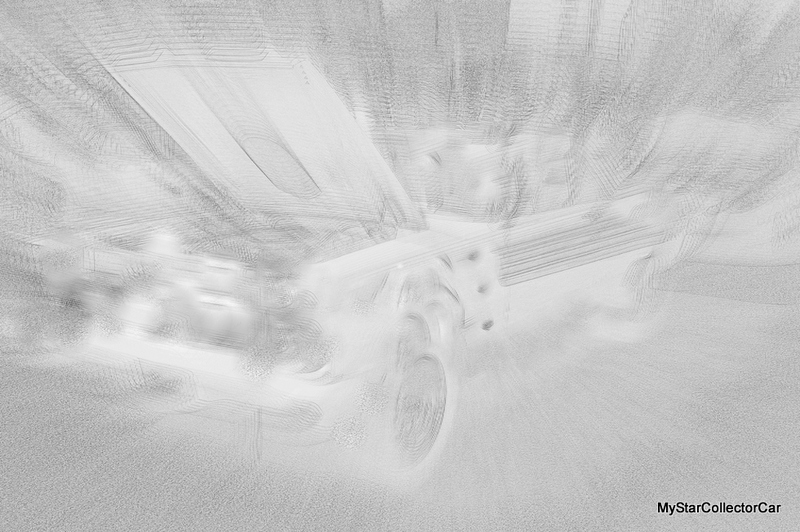 If it’s too radical check in tomorrow—there’ll be a full picture (with a label to tell you what the original vehicle was before the custom job). 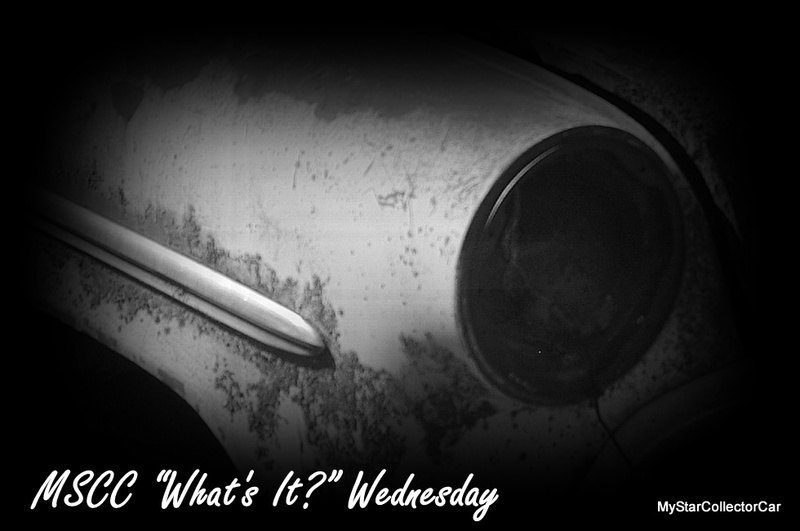 The “What’s it?” Wednesday concept started a year ago this month and it’s been a phenomenal success because car guys love a challenge. 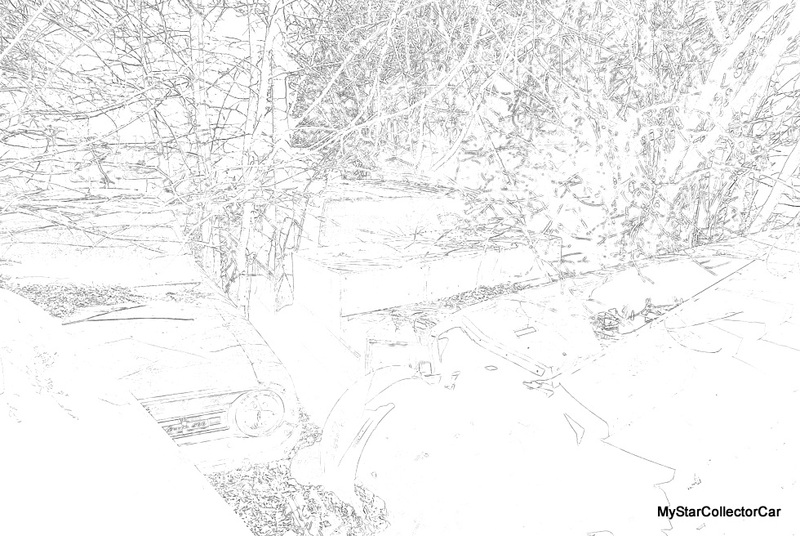 Today’s example is definitely a challenge so maybe this second clue will help. 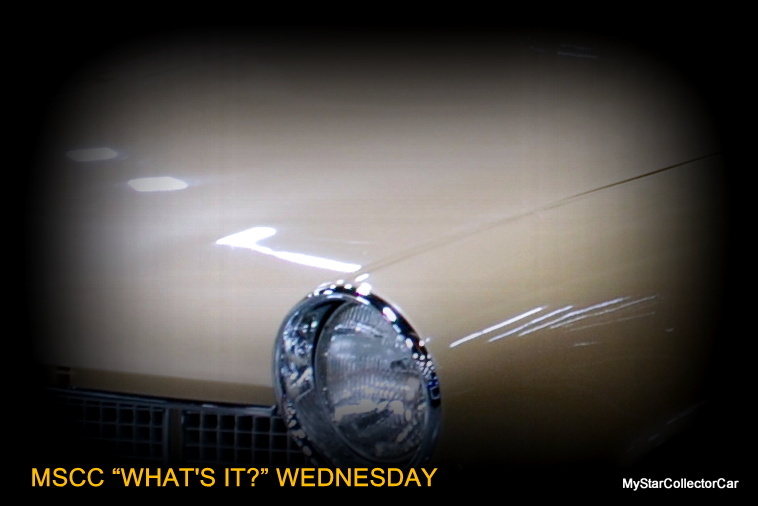 Check back on Thursday for a clear picture of this classic piece of iron. 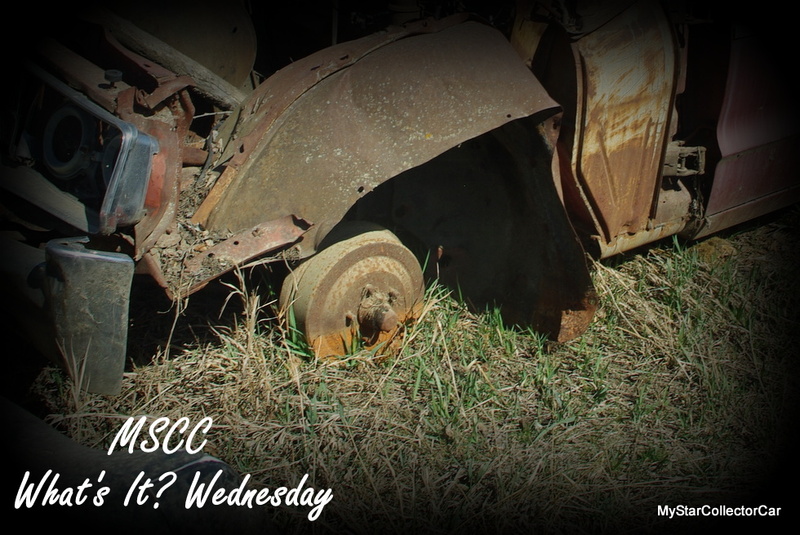 MSCC FEBRUARY 22 “WHAT’S IT?” WEDNESDAY: WILL A CLEAR PICTURE OF THE SUBJECT HELP? 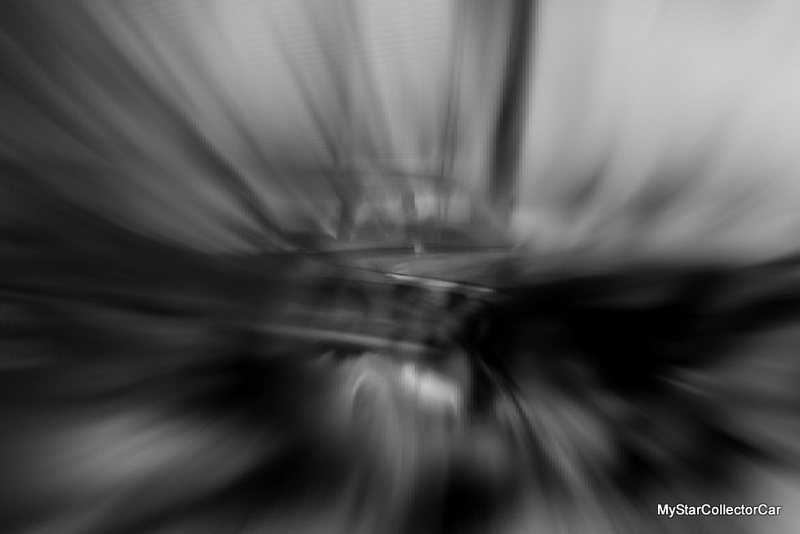 This “What’s It?” Wednesday subject is a non-distorted shot of the car so you’ll either get in seconds or you’ll never figure it. 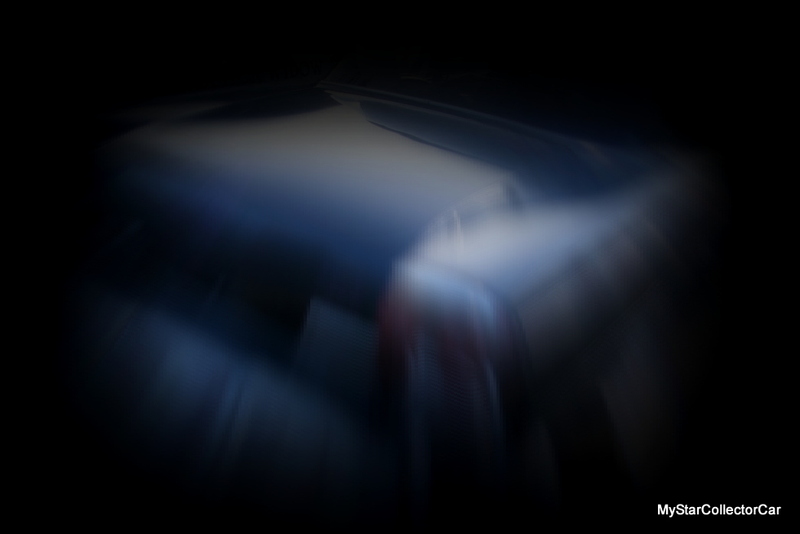 Here’s your second clue for an overall view of the car. Didn’t get it? Will a clear picture tomorrow help? 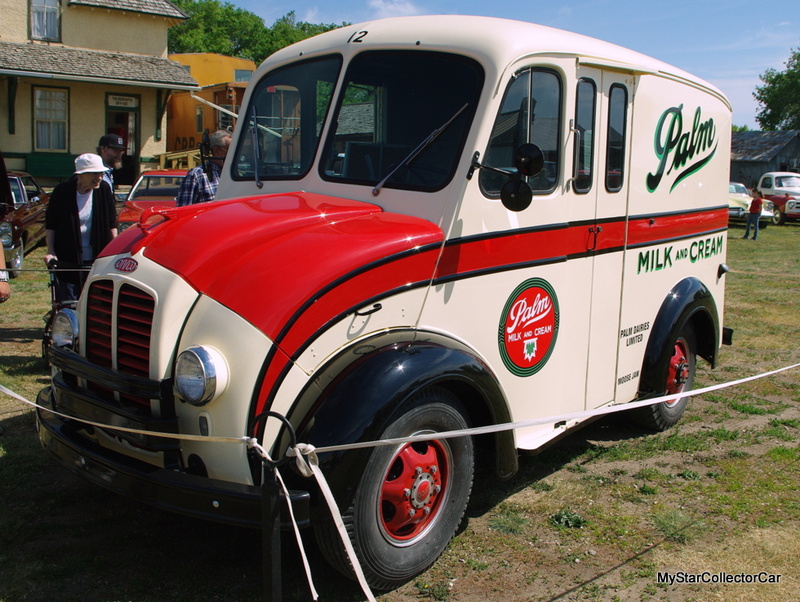 Old cars and trucks are the easiest vehicles in the world to ID because they are so unique. 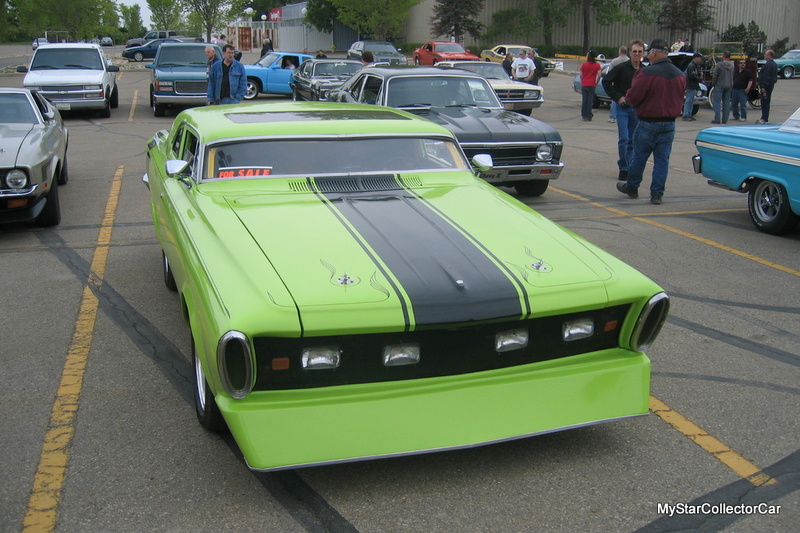 That’s fine when they’re completely stock but when guys add stuff to them it changes the game in a big way so here’s another view of the same vehicle. 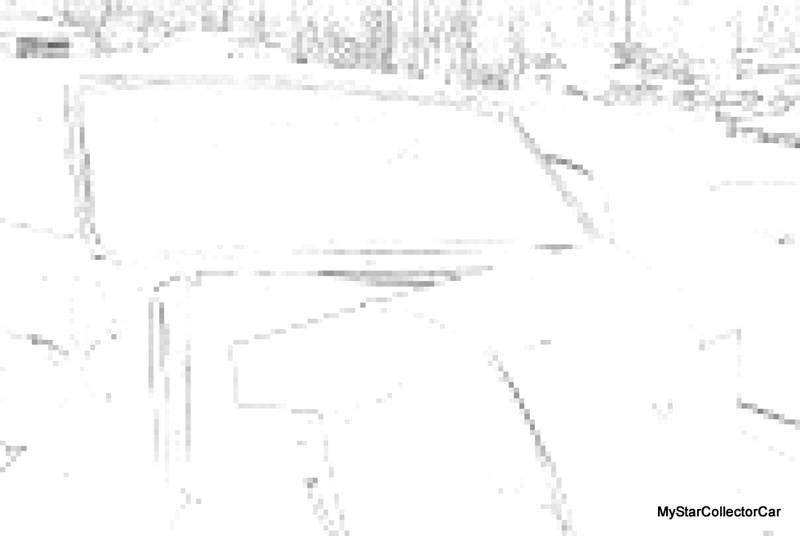 Check back here tomorrow for the answer. 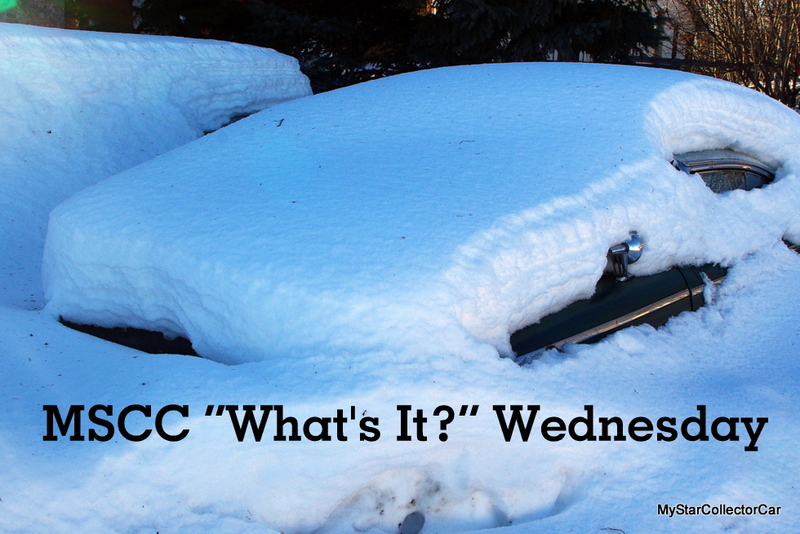 MSCC FEBRUARY 8 “WHAT’S IT WEDNESDAY?”— SO? 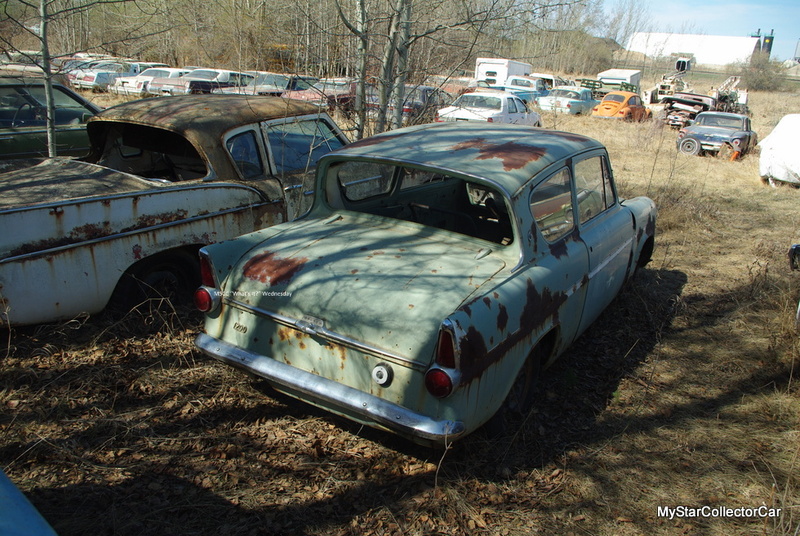 DO YOU REALLY NEED A TAIL LIGHT TO ID THIS BABY? 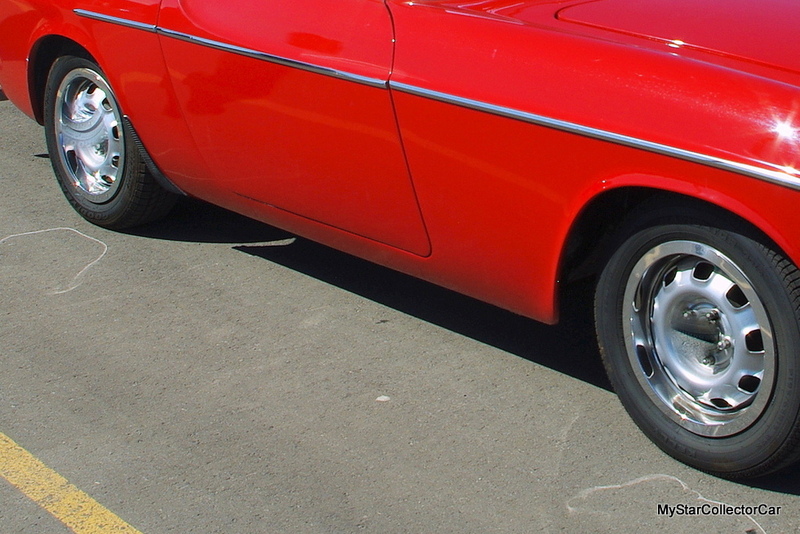 A complete car is far too easy to identify so here’s another stick in your spokes. 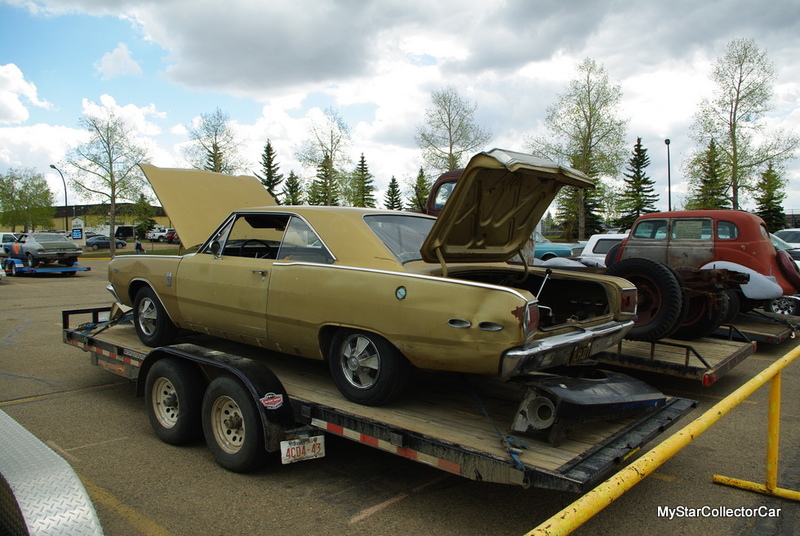 There are no tail lights on this baby so do your best and give it your best effort with this second clue. Failing that, check back here tomorrow. 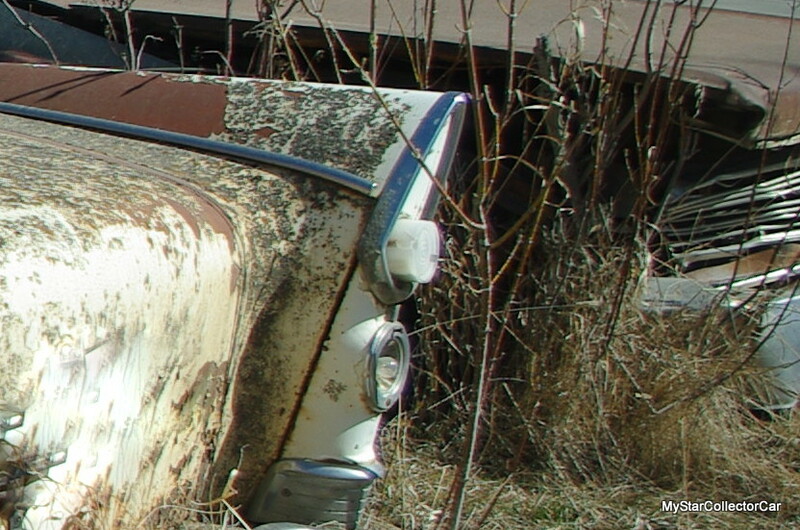 This is a relatively clear shot of a fender (for a change) but never judge a book by its cover. 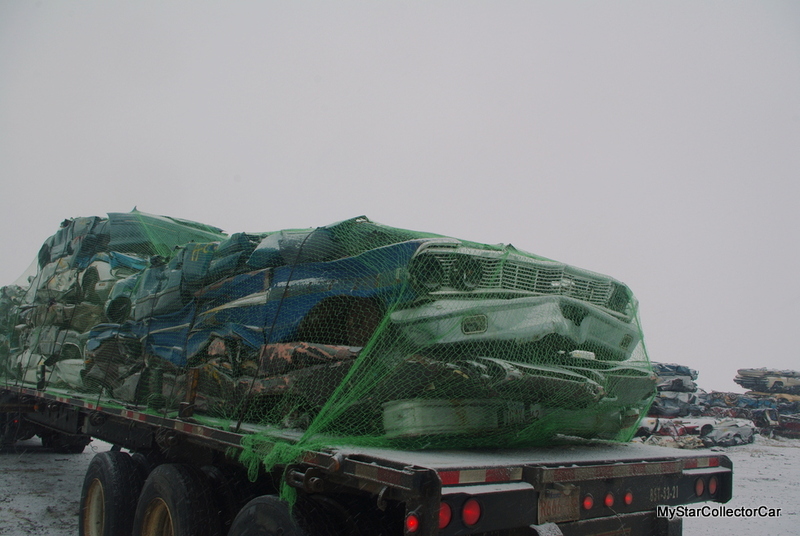 If that stumps you here’s a less clear shot of the whole vehicle. Failing that—come back tomorrow for the answer. 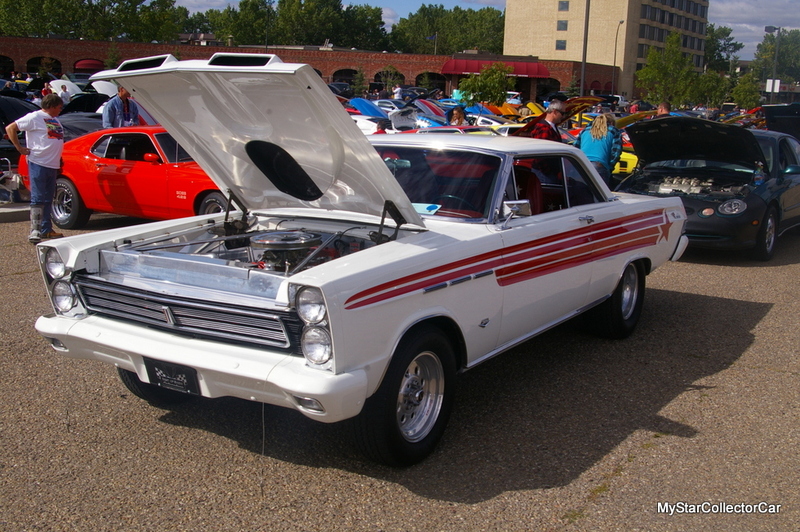 It’s a ’67 Dodge Dart. 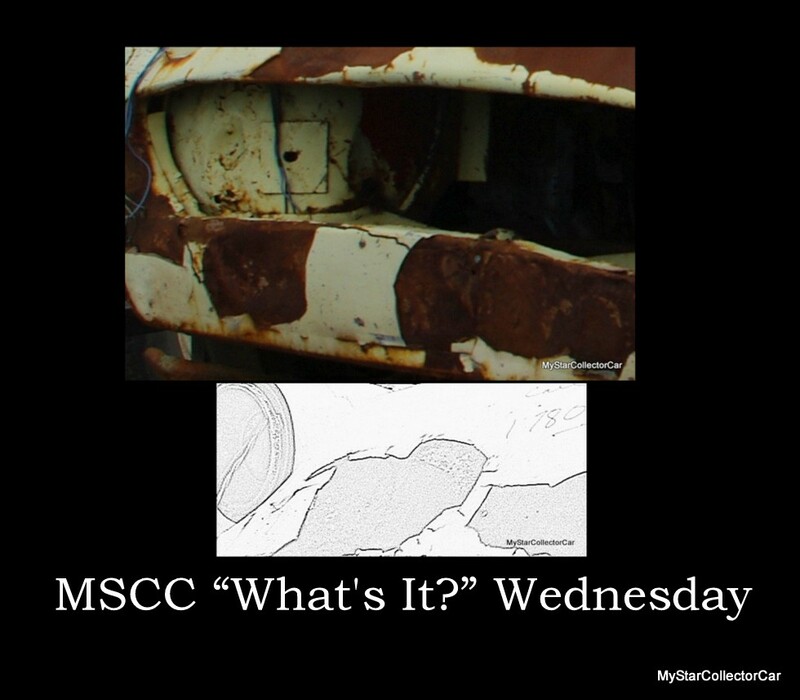 Many of the MSCC “What’s it?” Wednesday examples have been distorted because this isn’t supposed to be easy. 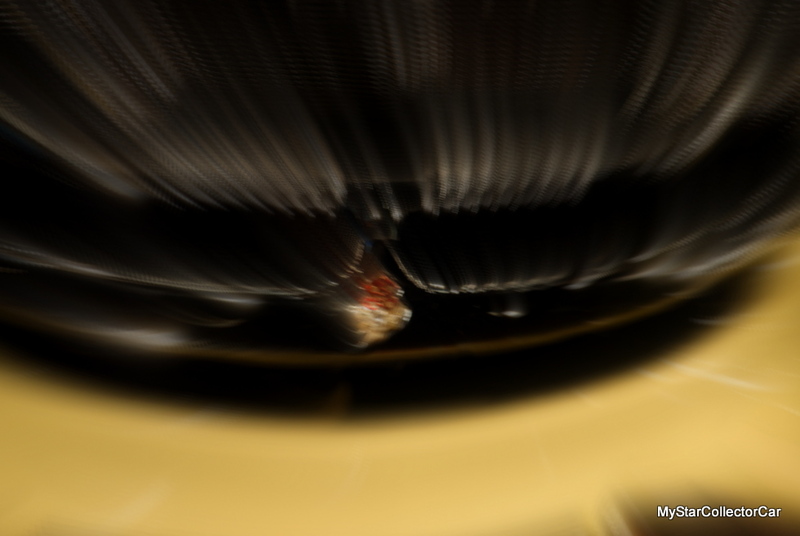 This one wasn’t distorted but maybe you need this shot to ID it. 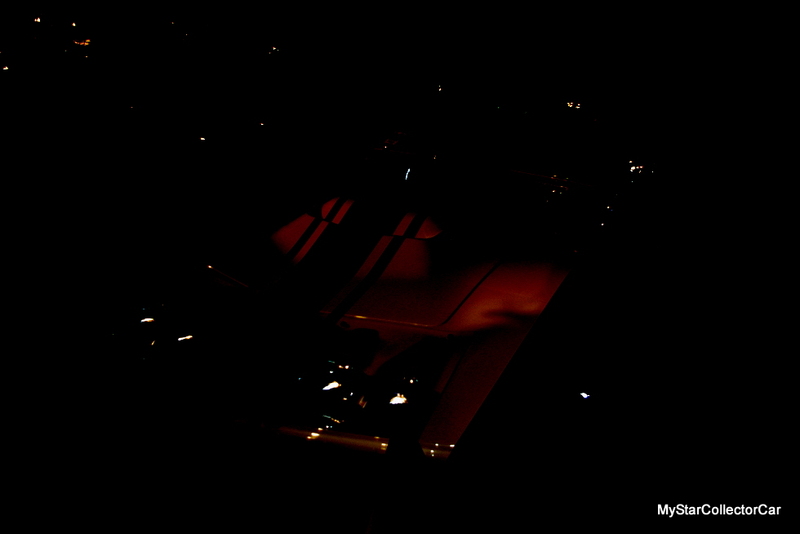 If not, check back here tomorrow for a clear shot. 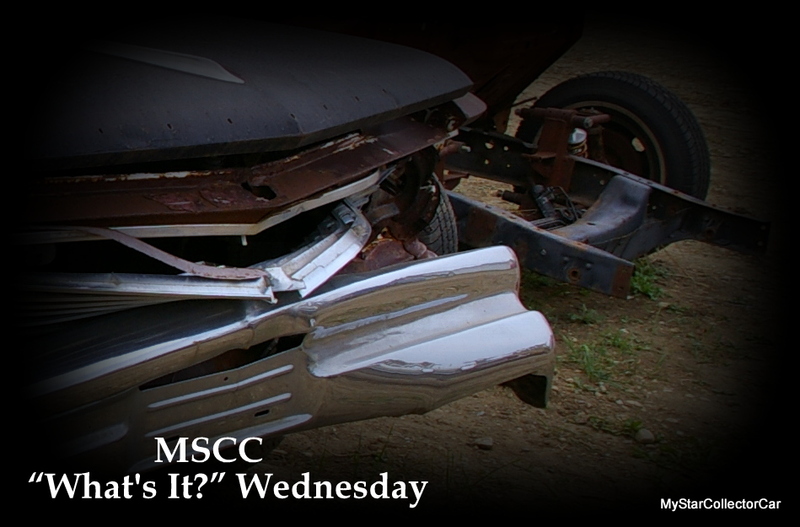 MSCC JANUARY 18 “WHAT’S IT?” WEDNESDAY—CAN YOU ID THE SMASHED-UP VERSION? 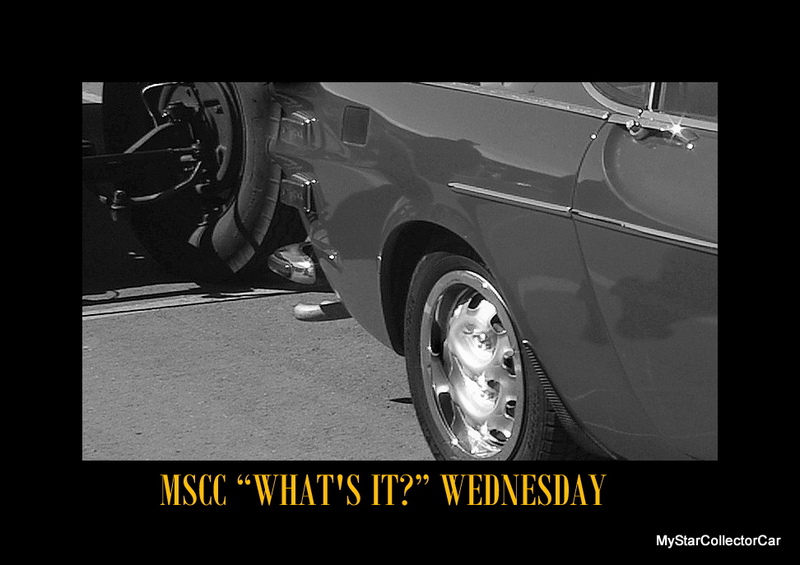 These MSCC “What’s it?” Wednesday rides are designed to be tricky but now there’s a new element to the game. 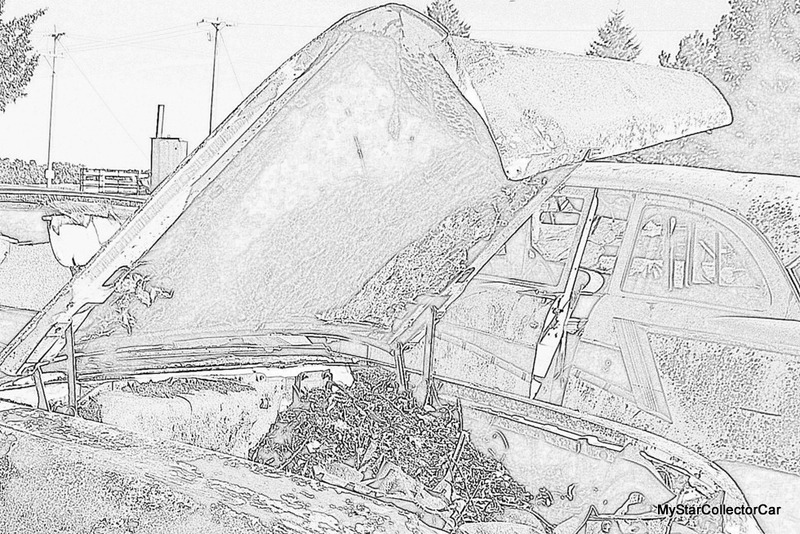 This one was crashed so here’s another look at this victim of bad driving. If that doesn’t ring the bell, check back here tomorrow. 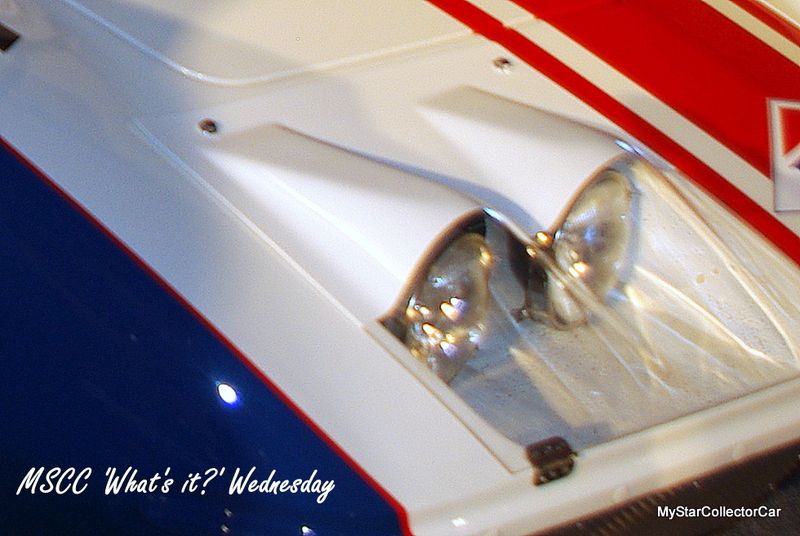 You rarely get a clean look at a “What’s it?” Wednesday headlight so this is an exception to what few rules there are in this game. 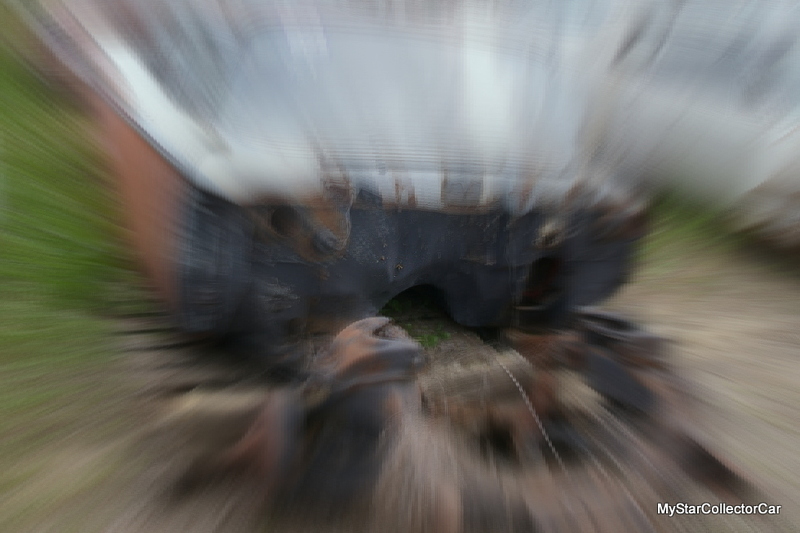 Maybe you need an overall view no matter how distorted it is so here’s your second clue. 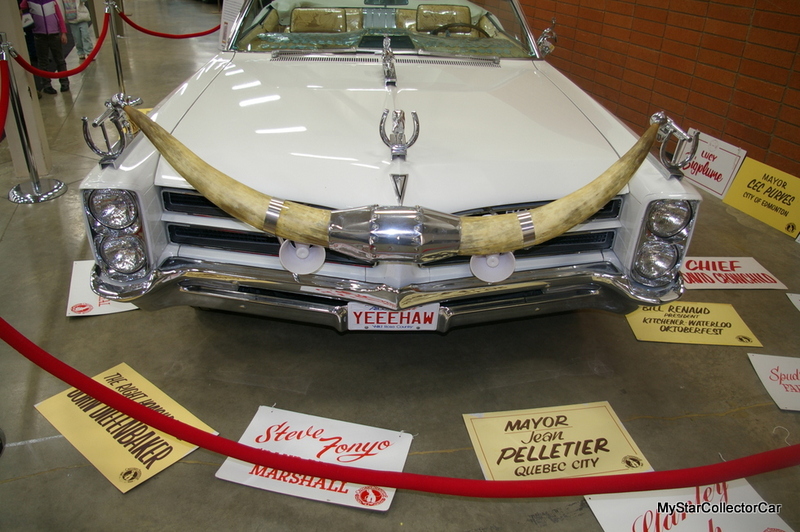 Maybe you’ll need to come back and see this third picture tomorrow because it’s an actual view of the vehicle. 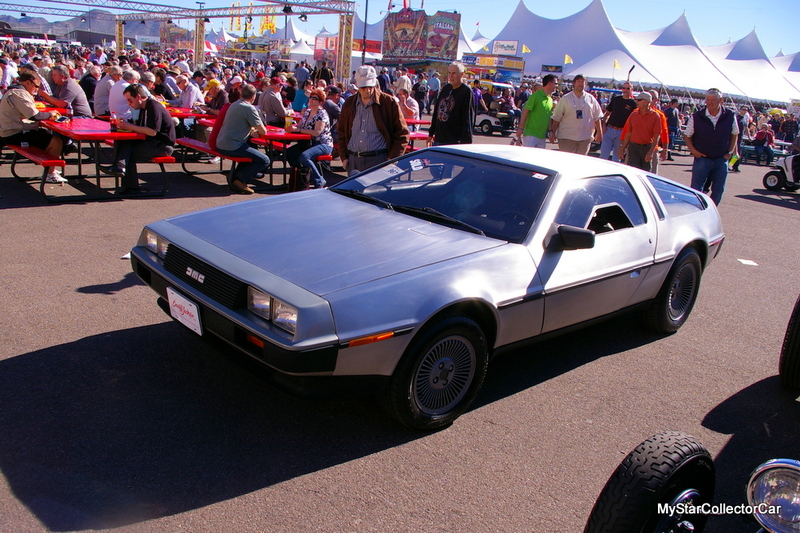 This is a very common classic ride but it’s distorted just enough to make it difficult plus it’s missing a few pieces. Come back here tomorrow if you don’t get it.